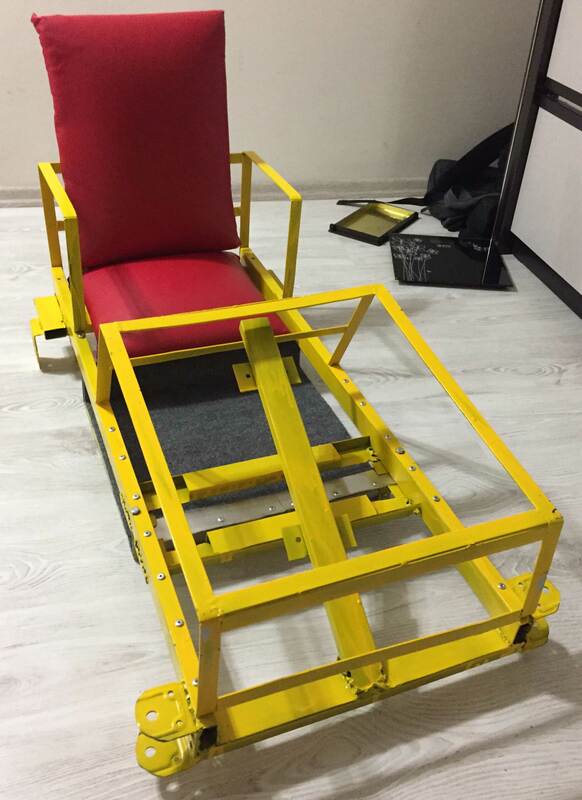 Bu makalenin Türkçe versiyonu için lütfen tıklayınız. 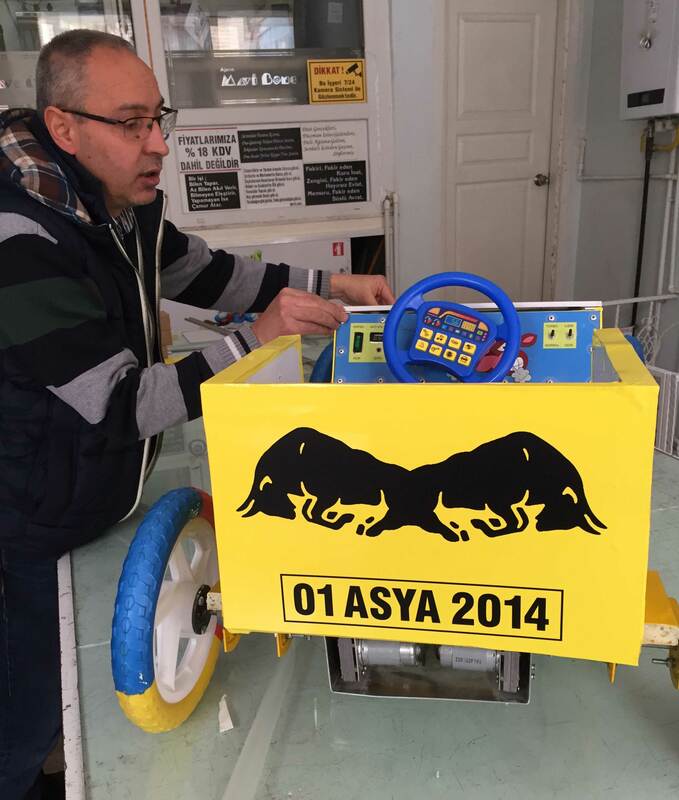 Ever since I was a child, I always be possessed of a battery-powered car; if it is possible to do it on its own, So I decided to DIY Battery Powered Car. After a little preliminary research I did, I finally decided to go into this business. 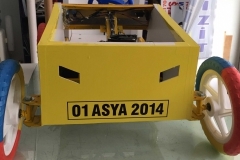 I started out by taking the welding machine, which is my biggest drop, because I think the car chassis is box section. 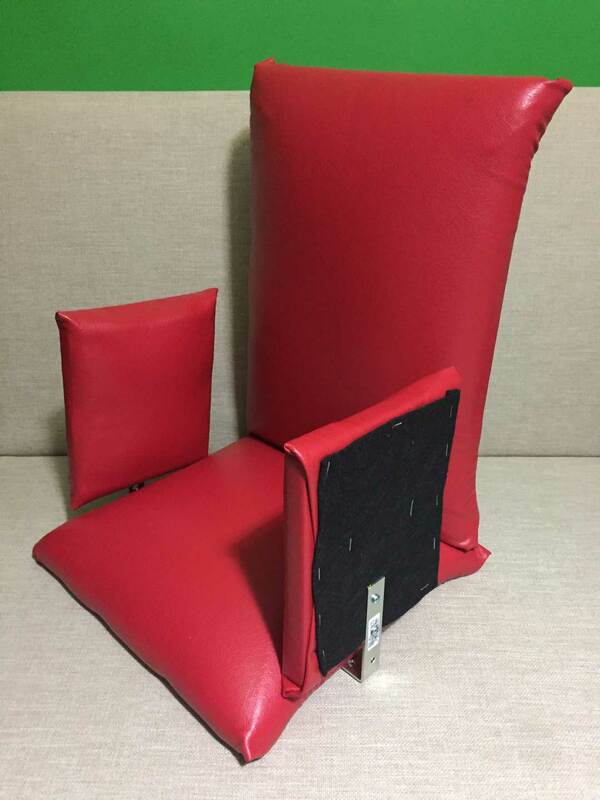 The design and manufacturing phase began at the same time, and this process was also transformed into a research and development work for me at the same time. 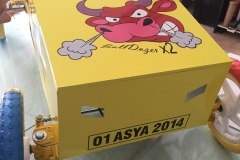 I will try to present each unit of material I bought in the construction phase together with their prices as a table. Because the list of used materials is changed and updated every time; I will share this table at the end of the article. 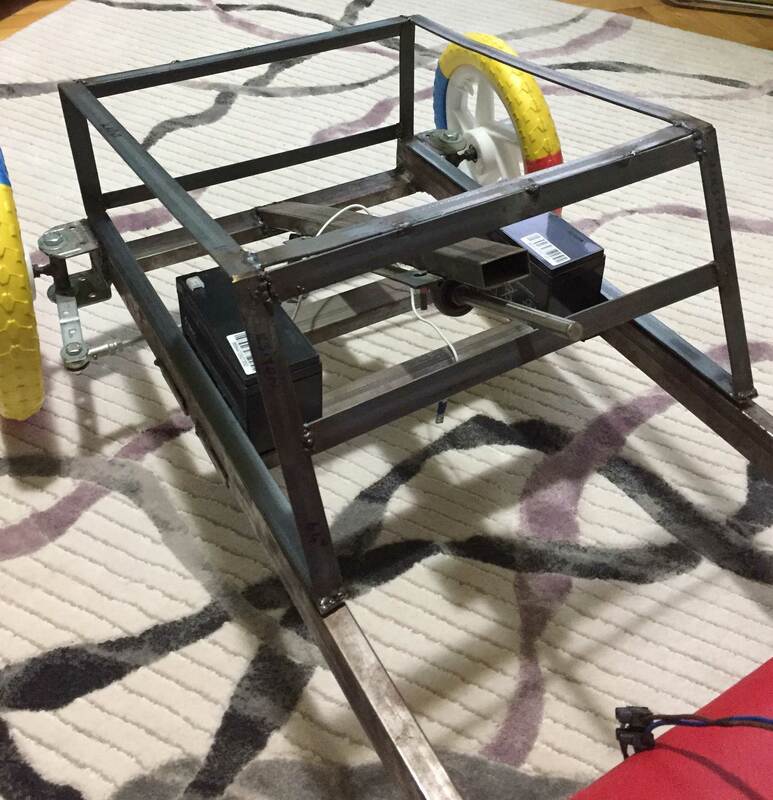 Since the car will be electric, the weight will be the most difficult part of me in the project and the maximum value I aim at is 20 kg. 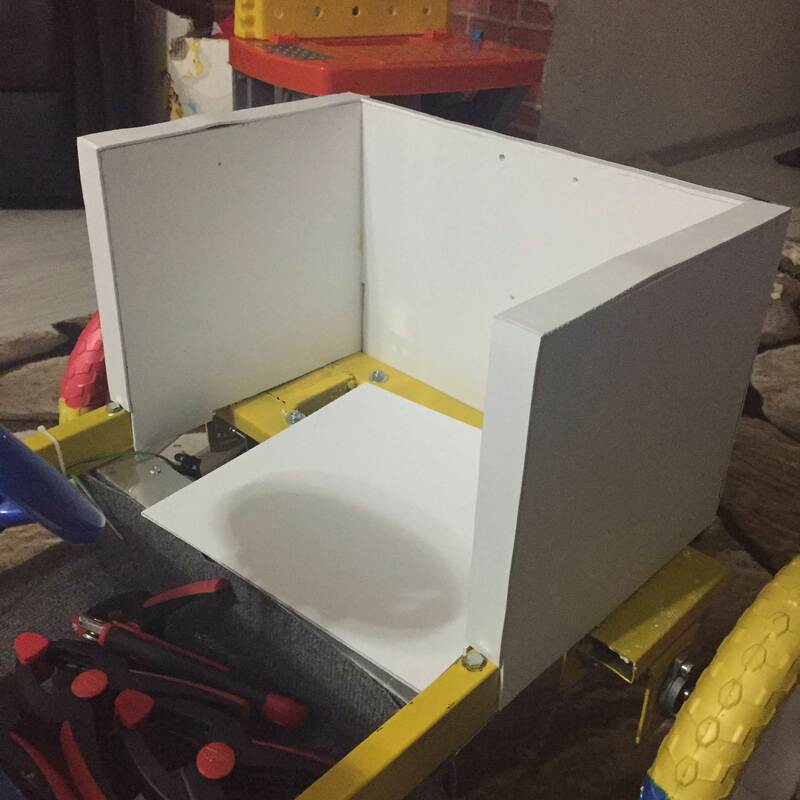 I started work on the engine compartment and chassis side at the same time and tried to do a part where I found every opportunity. 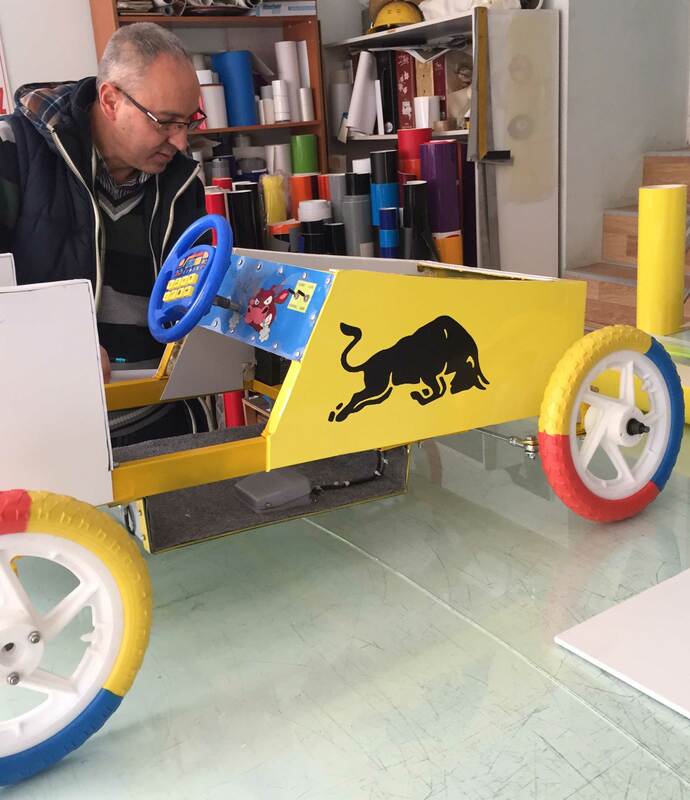 The work will be described in chapters and the engine part, which is the starting point of the project, is as follows. 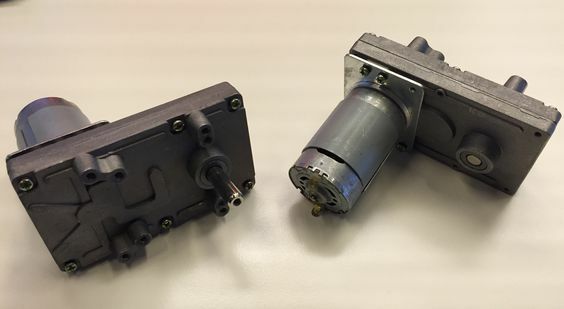 I decided to use the Takanawa 555 Metal Gear Motor, which was also used on electric bikes after my small research. 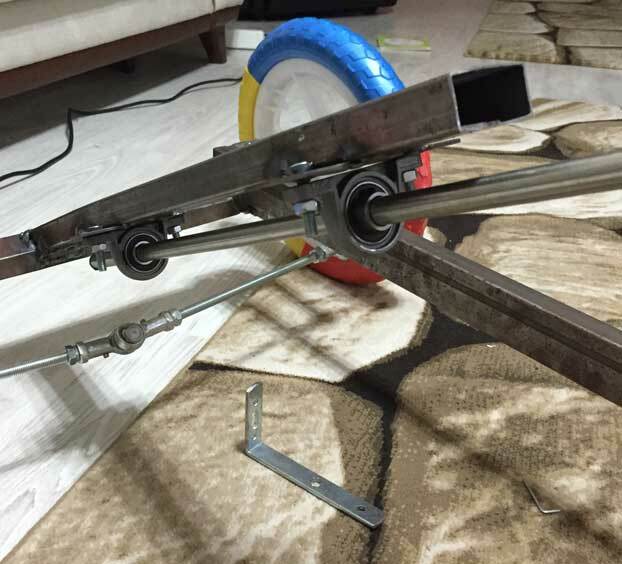 I could not find this motor gear in Turkey and I had to order through AliExpress, I was lucky that my hand reached within 15 days. 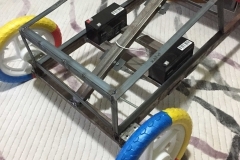 I was informed that the engine specifications can run between 3 and 24 volts, but I could easily work with 12 volts in the test, and when I tested it with 24 volts, I saw that I achieved the highest performance. 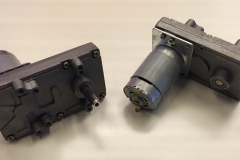 Since I thought of a dual-motor arrangement from the beginning, I ordered 2 motors. 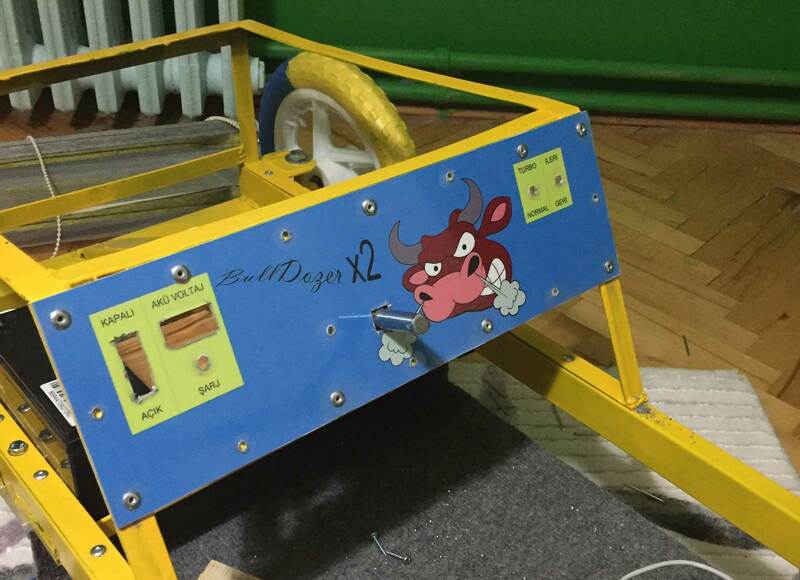 The measurements of each motor are as shown in the pictures. 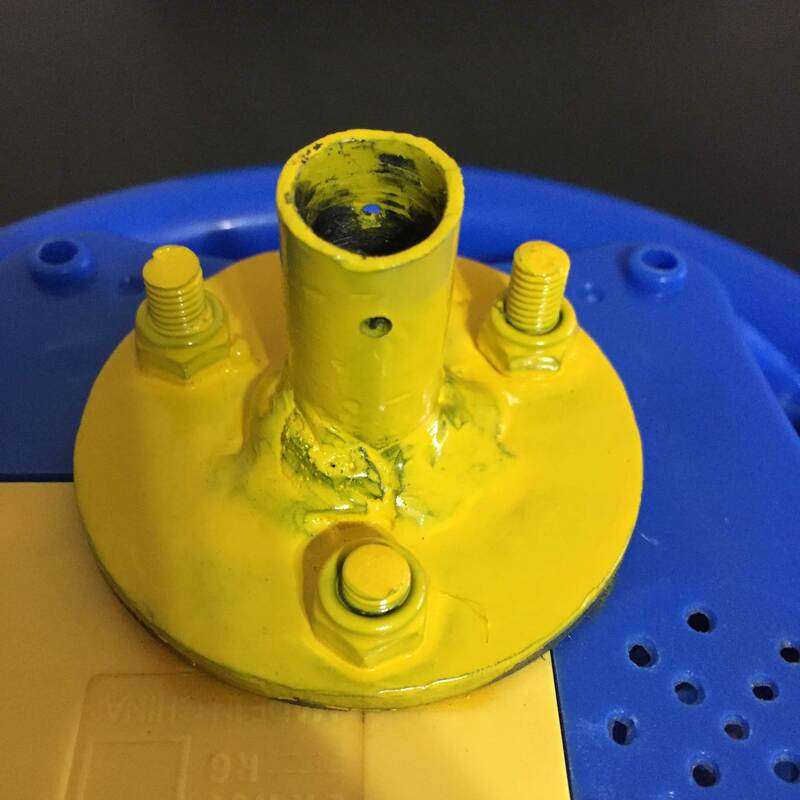 Using this data at hand, I prepared the following template for mounting the motor to the housing. 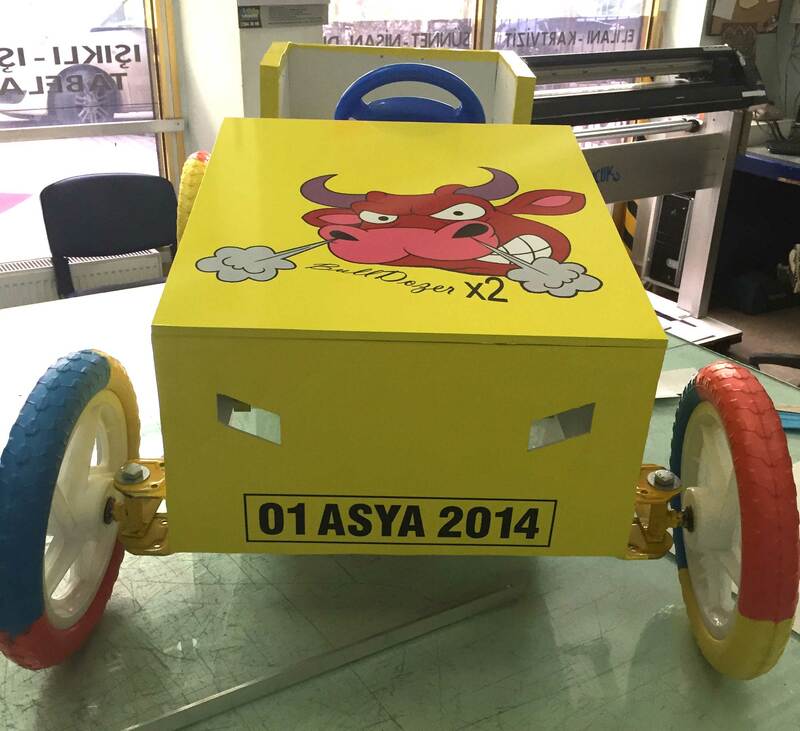 The template is prepared for A4 Size and when the image file is output, you get the template. 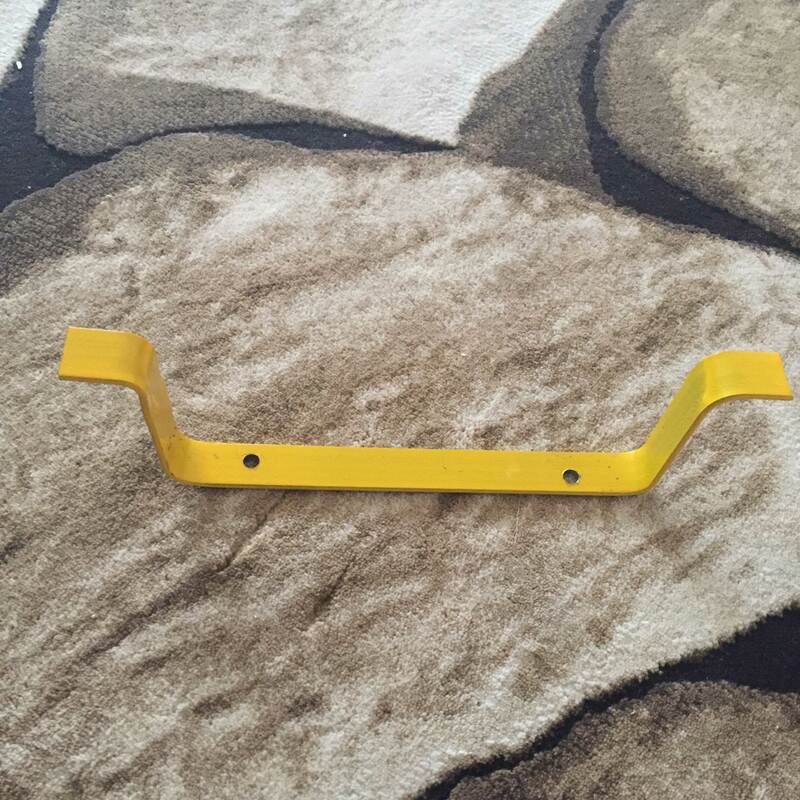 For Mount, I used the following metal plate. 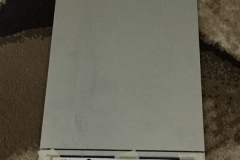 This plate measures 120x1000x1.6mm. 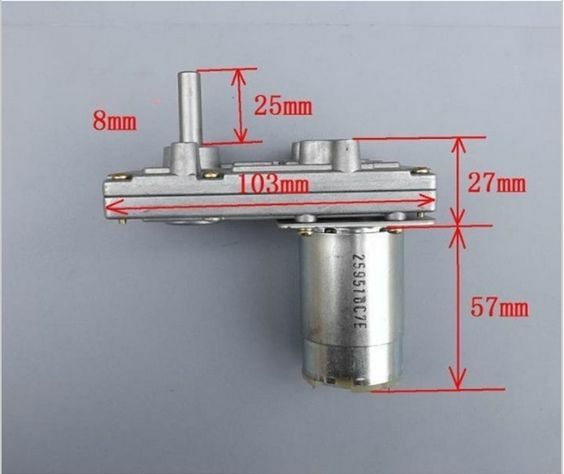 With the help of the template on the hand, I pointed out the connection points of the motor and I drill the parts with black spots at the indicated diameters. When thinking about how the plate on my hand could bend; the pieces of wood were ready for me and made me bend as I wanted. 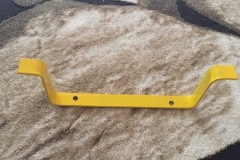 I did not do the cutting process on the plate until the bending process was finished. After reaching the mount I thought I cut the plate and reached a mount like the one pictured. I fixed the motors to the mount with M4x16mm screws. 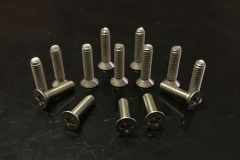 These screws were also recommended for motor connection. 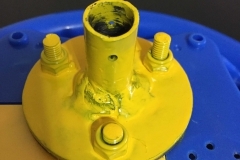 In order to minimize the problems that may arise from the vibration between the motor and the housing, I placed an old inner tire in this area according to these measurements before cutting and screwing. 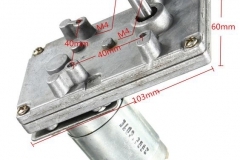 The M4 screws I use for motor mounting look like the picture. 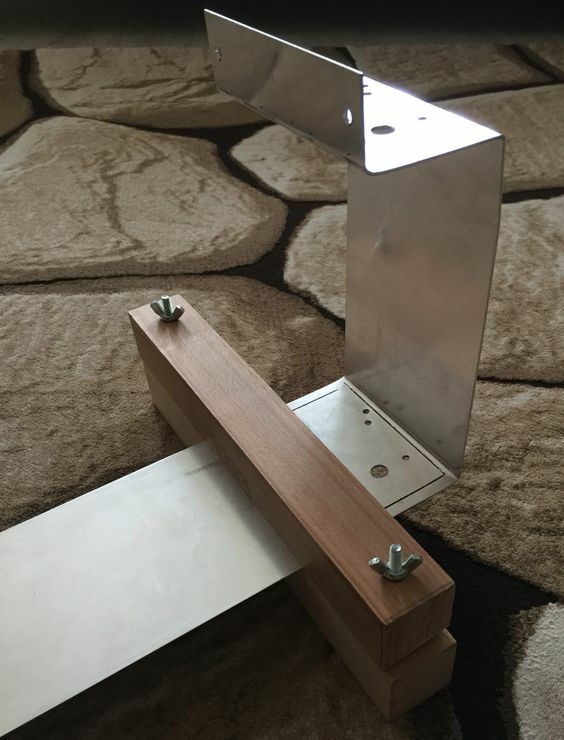 I also used the screws, washers and nuts in the picture below, taking into account the dimensions of the box section for connection between the motor gear box and the chassis. 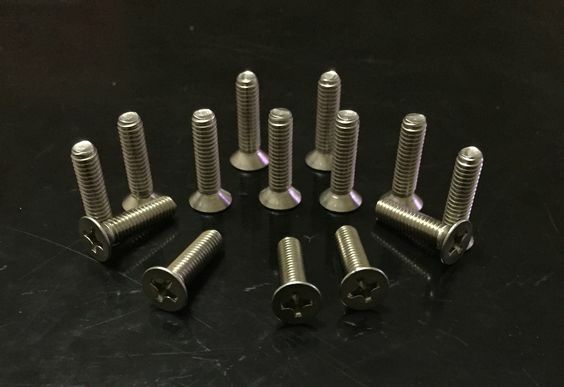 The screws are in M6x40mm dimensions. I used an M6 nuts. 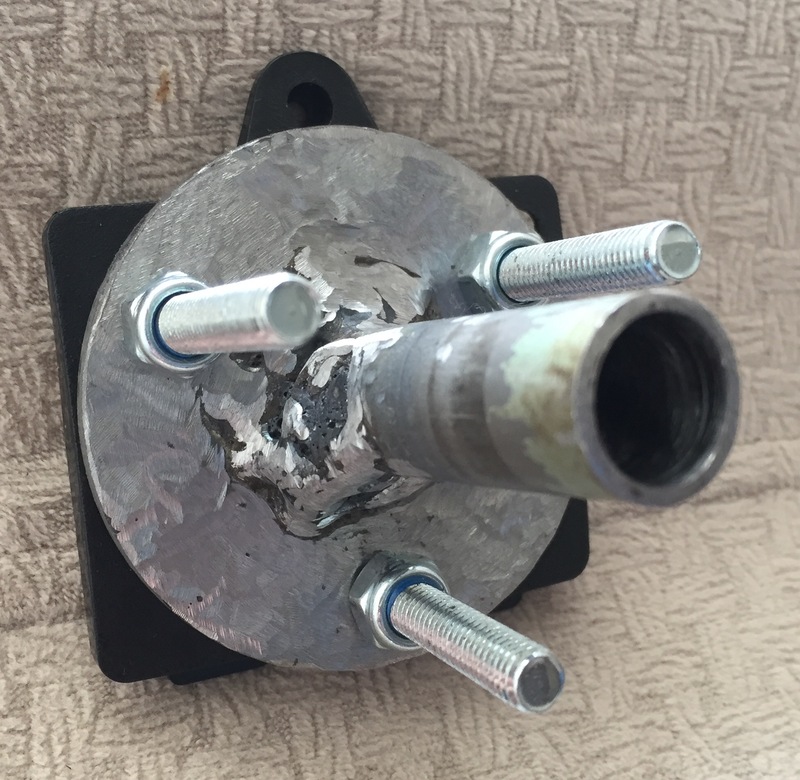 The project is complete; I am trying to use a stop nut to prevent looseness caused by the jolt in the future. 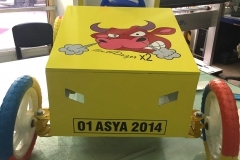 I chose 100 x 40 cm dimensions for chassis outlines and I used a 20 x 40 mm box section to keep the weight to a minimum. 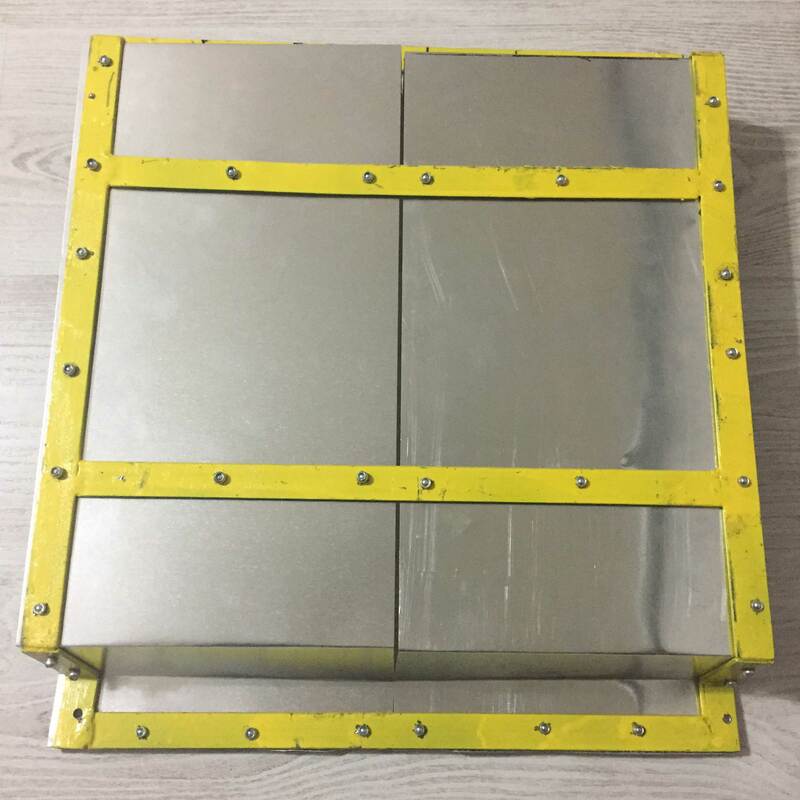 The box section thickness is 0.90mm. 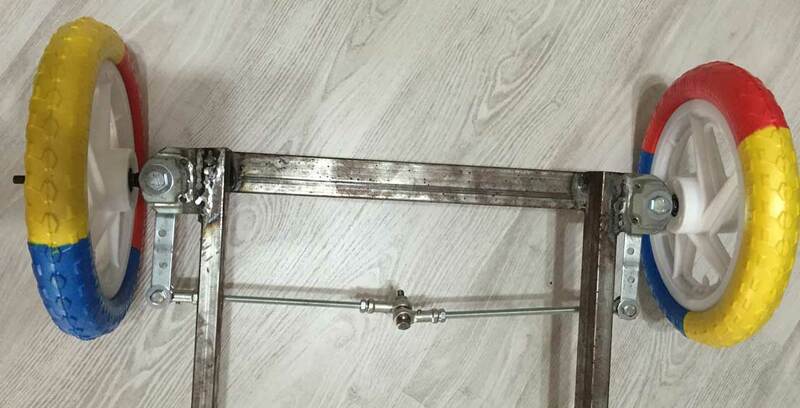 The chassis looks like the picture. 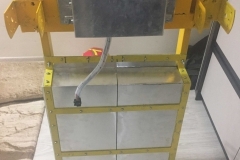 Since the profile thickness is rather thin, I placed 40mm of the box sections placed transversely to me to increase the resistance so that the 20mm section of the longitudinally positioned box sections would be facing me. 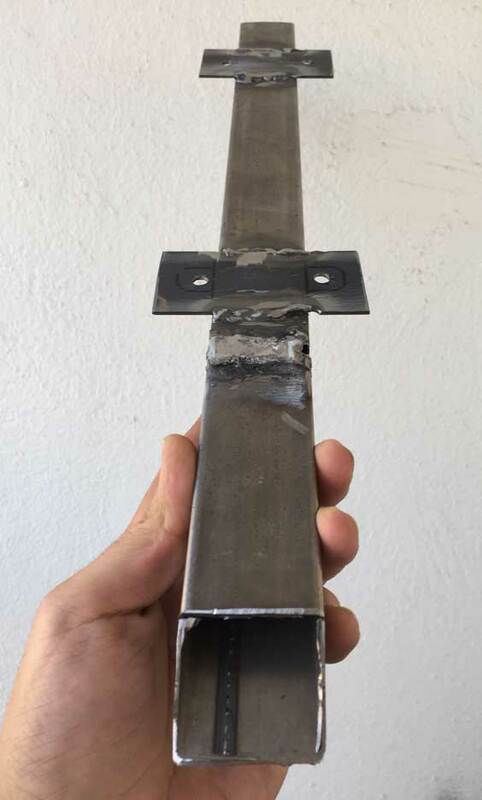 Instead of cutting the corners angled, we placed the long profile on the short sides and made the welding process that way. 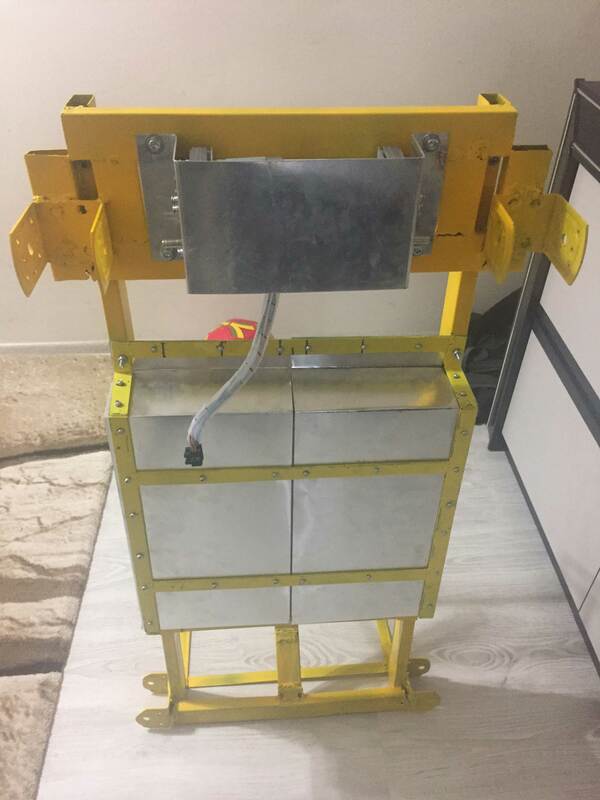 The mounting of the motor compartment, which I described in the previous heading, will be mounted just below picture list the visible part. 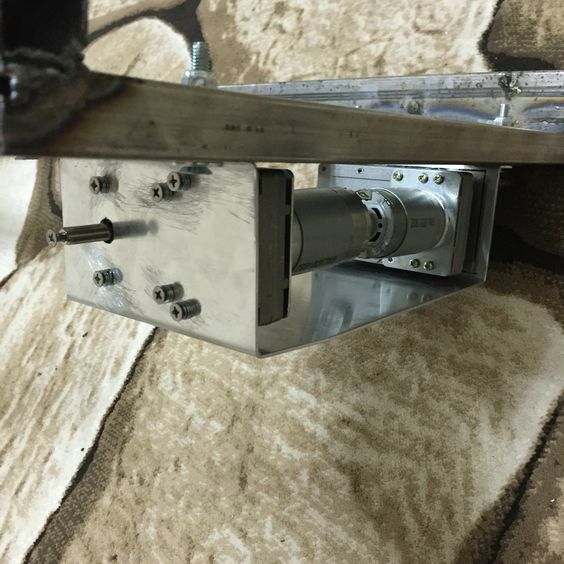 The motor mount will completely fill the visible gap. 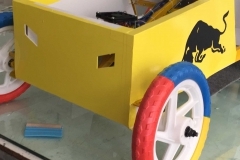 The small box section pieces that are visible on the side are considered to provide the connection of the rear wheel shaft to the chassis. The connection made is like the picture. 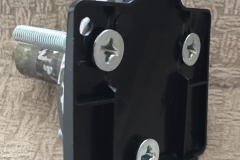 I used the M6x40mm screw and M6 nut which I gave at the end of the previous heading for the connection. 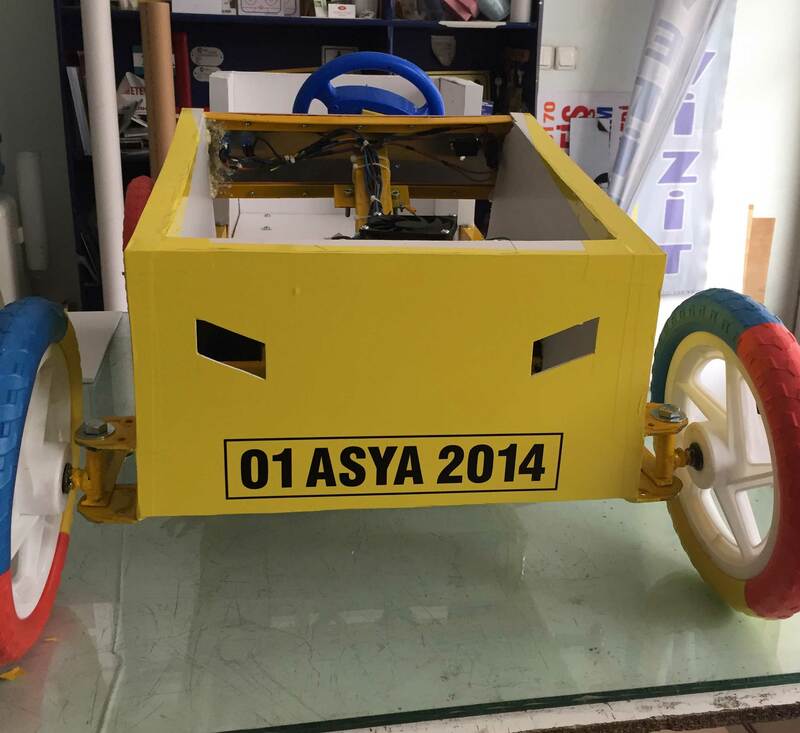 The chassis front is like the one pictured below. The winglets on the building markets under the wall holder name. 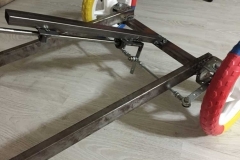 I needed such a structure for the front tire connection and the steering wheel connection. 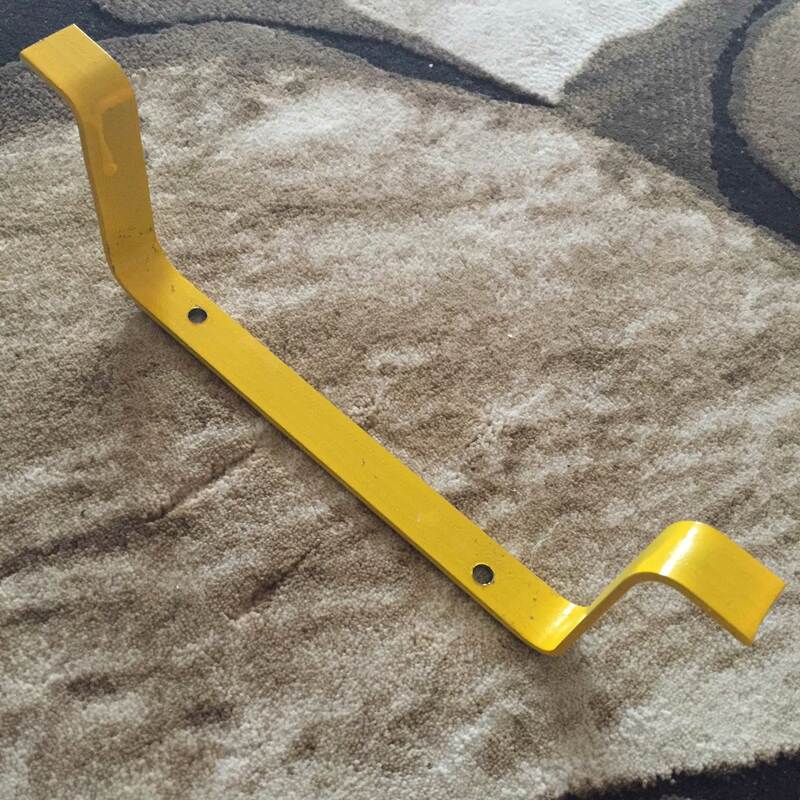 I used 2 sizes (12 meters) of 20 x 3 mm wedge iron (flat bar) for hood and other parts. 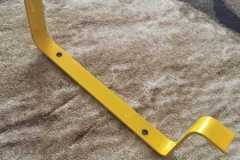 It was quite easy to do the wedge iron (flat bar) bending work I used. Of course, inexperience and curvatures became the subject, but the way I wanted helped me to match the measurements I thought. 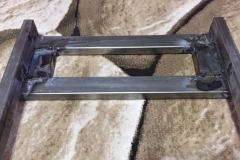 I made the bending process by the method that I used in the motor mount, but since it is thicker than the iron, I will bend, and at the points I applied a little rebar without damaging the flat bar. The hobby handcraft (Dremel 3000) for cutting and such corrections has been quite frustrating due to the high turnover. 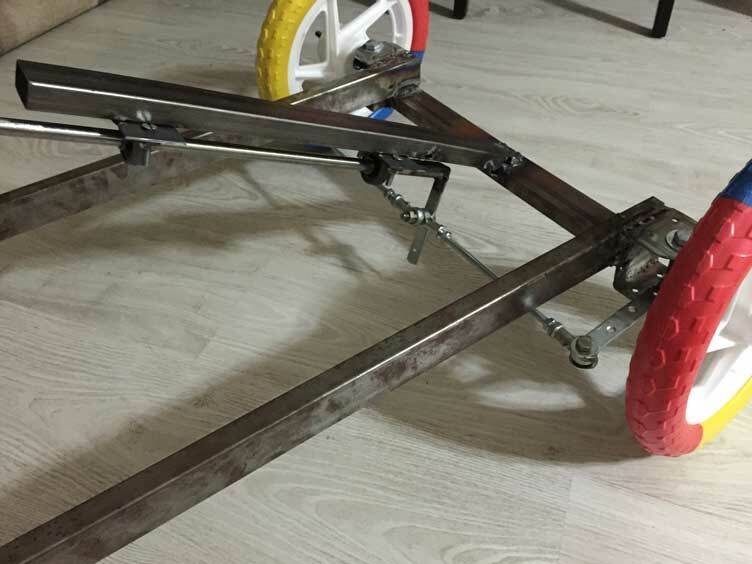 I prepared the skeleton by riveting it on the frame, and for this, I opened 7 pieces of 5mm holes on the chassis after painting. I did not want to sour if there was a situation that I had to open again for a reason. You can find related pictures in the gallery of this title. 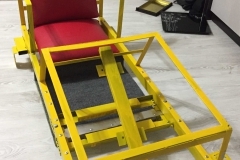 At first I thought the driver’s feet would stay on the chassis, but after seating the steering wheel, I noticed that this was not much of an issue, and I lowered the equivalent footprint of the feet by 7 cm. Again, I gave you the picture you can reach in the gallery below. 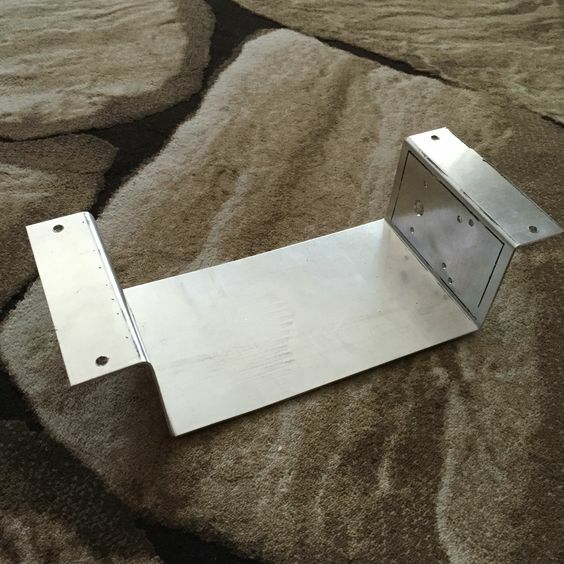 After dyeing, I first applied a sheet metal on this area and fixed this sheet metal plate with rivets. 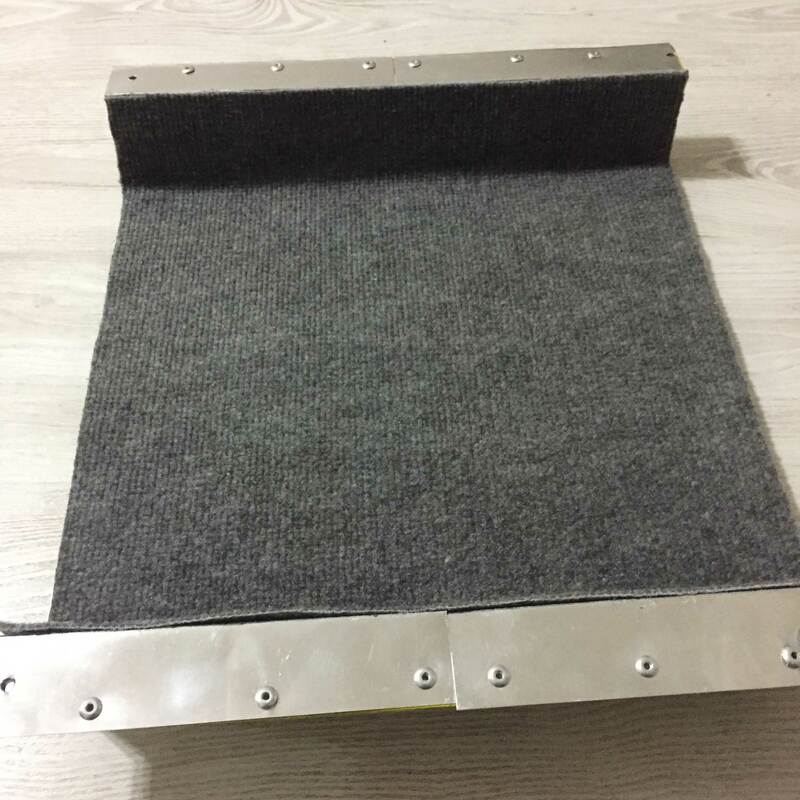 To prevent my daughter from being damaged by the electrical escapes and the sharpness of the sheet I glued the sheet metal with the insulated carpet floor. Instead of fastening the foot to the hood like the hood skeleton, this time I fixed the chassis with the help of the M6 screw. The gas pedal was configured on this area. 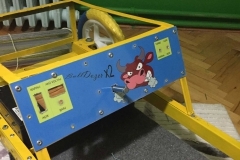 The last operation on the chassis is; I made a simple protective skeleton with wedge iron (flat bar) to both shape and protect from the sides and from behind. After the painting process I fixed this part by riveting it on the chassis. 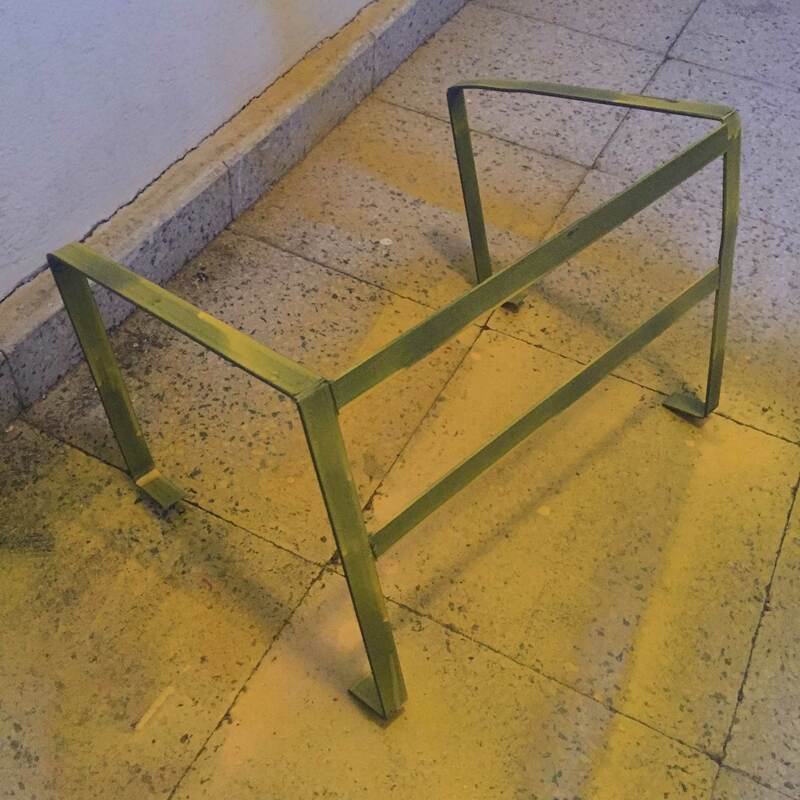 The seat is completely fixed in this area. 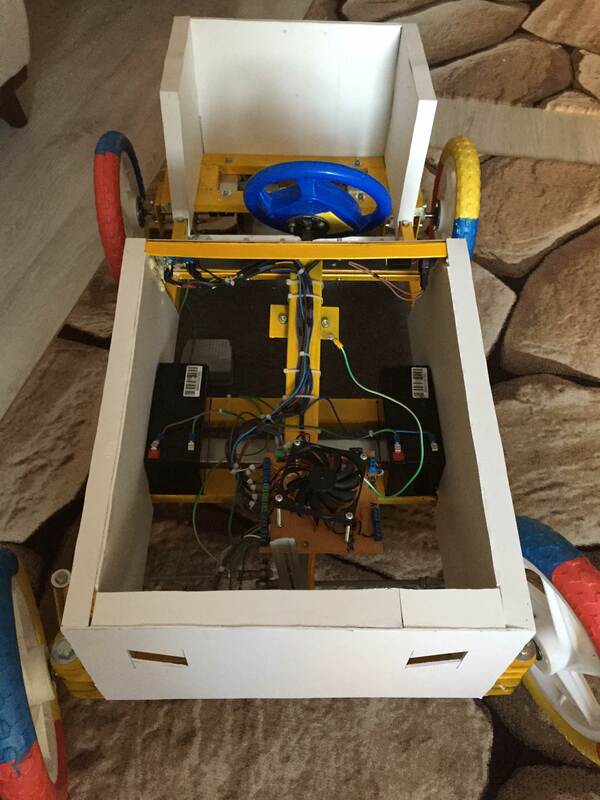 For batteries on the front part on chassis; I created a field in the scale of the individual. 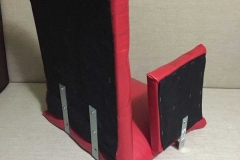 But for any reason, when I need to lift or reverse the vehicle, I have made a simple protection system so that they can get rid of their pockets. 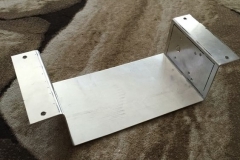 I used 20 x 3 mm wedge iron (flat bar) 40 cm long for this enclosure. 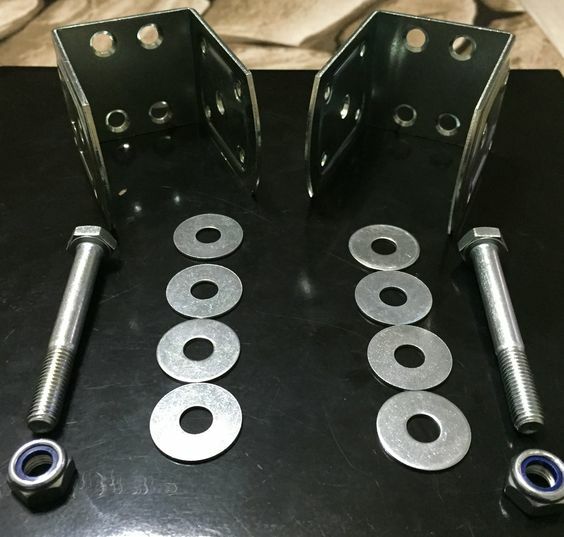 I made the required bendings in the direction of the measurements I made and drilled 2 holes 6 mm in diameter. 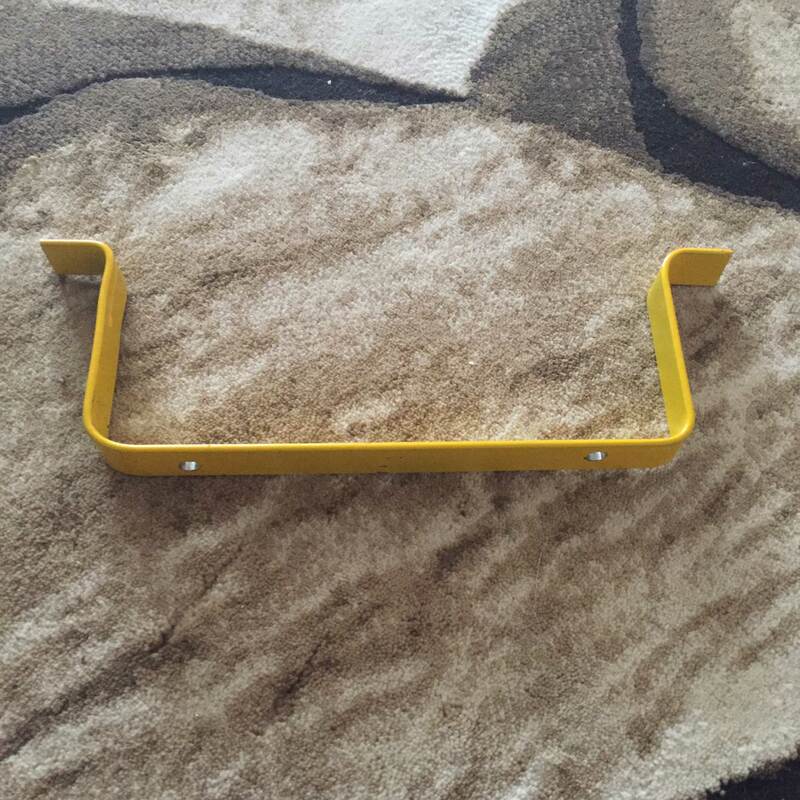 I painted this little piece with chrome yellow which I used all over the chassis to prevent rusting. 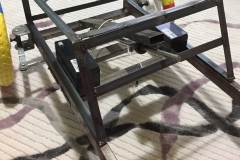 Son olarak By temporarily securing it to the place I prepared for the battery compartment on the chassis, I came to the place corresponding to the hole in the casing on the chassis. 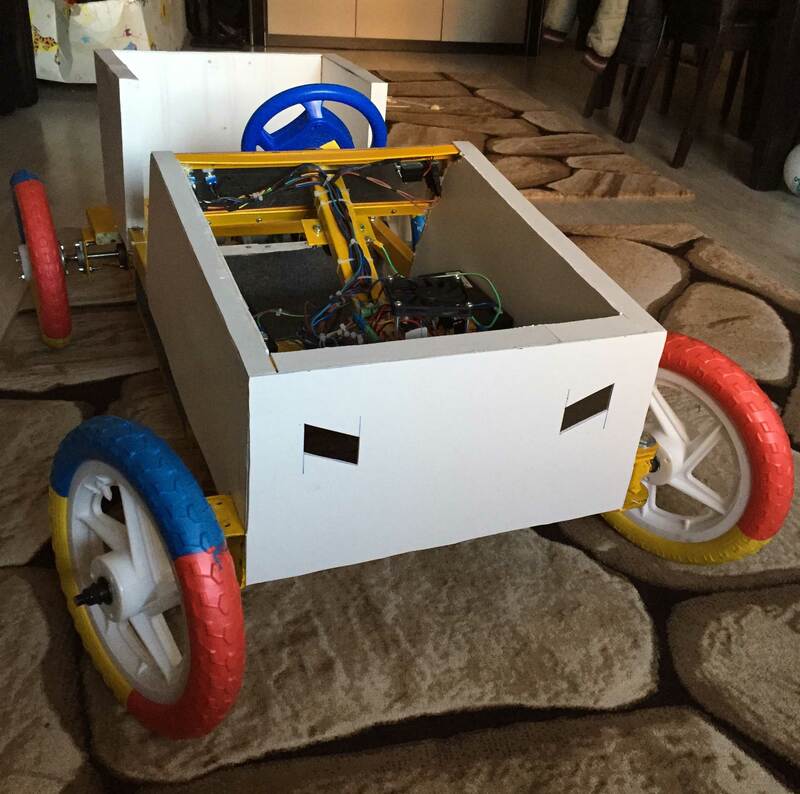 I fixed it on the chassis with M6 screw and nuts. 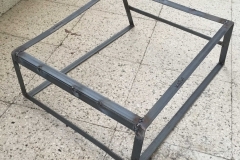 In the whole project I tried to use as much as possible M6 x 40 mm allen screws and M6 nut. So in case of any problem I can do demounting with the same key switch. 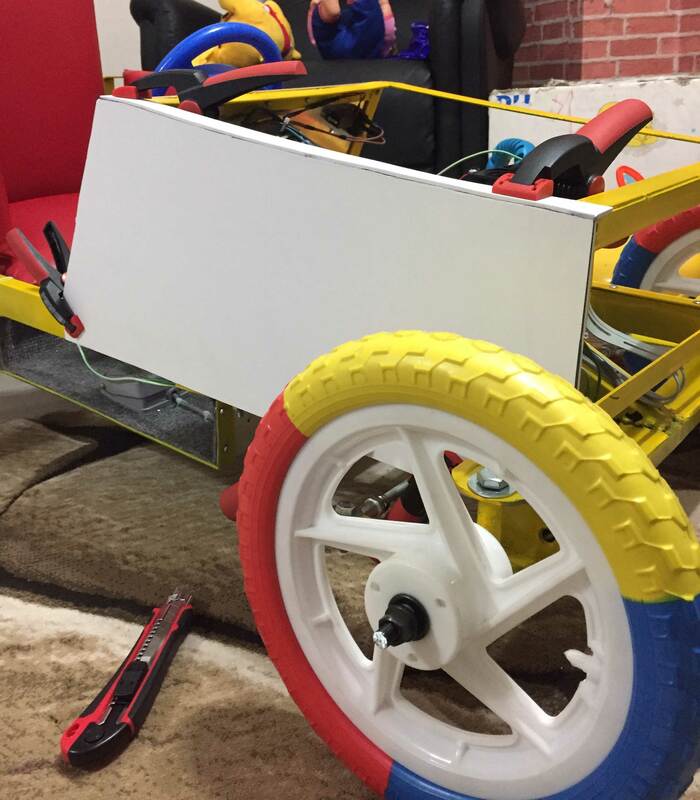 In the pictures below you can see both the prepared skeletons and the assembly on the chassis. 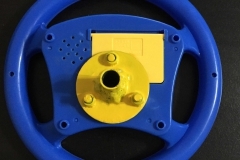 I had to make my own flange in order to place the steering wheel 12 mm shaft in diameter. 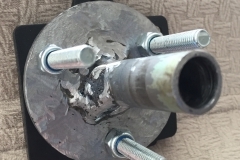 On the large washer I used for the rear wheels, I welded a pipe with an outer diameter of 15mm and an inner diameter of 12mm, and I drilled holes 6mm in diameter from 3 different points as shown in the picture. 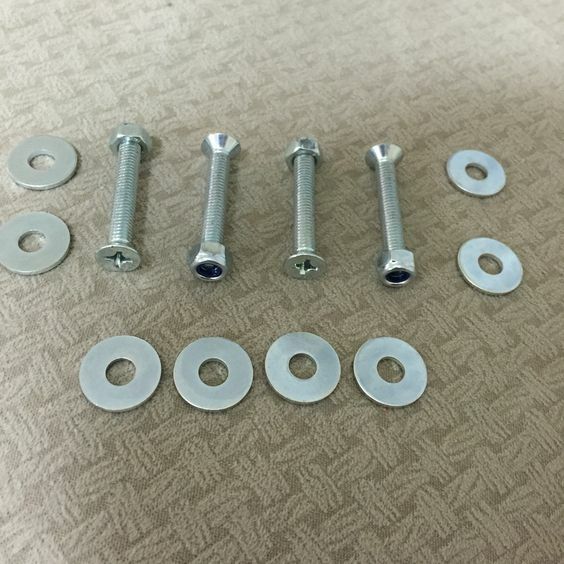 The screws are long in the picture but when I place them in the car, I try to configure it by fixing all kinds of bad images and mistakes. 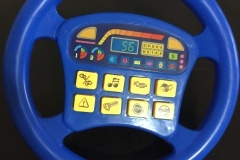 The steering wheel is a toy with audio functions on which I buy from the toys shop. 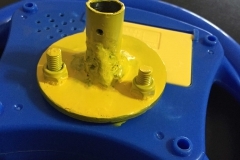 The battery housing lid overlaps with the diameter of the piece of luck and the connection has been made without trouble. 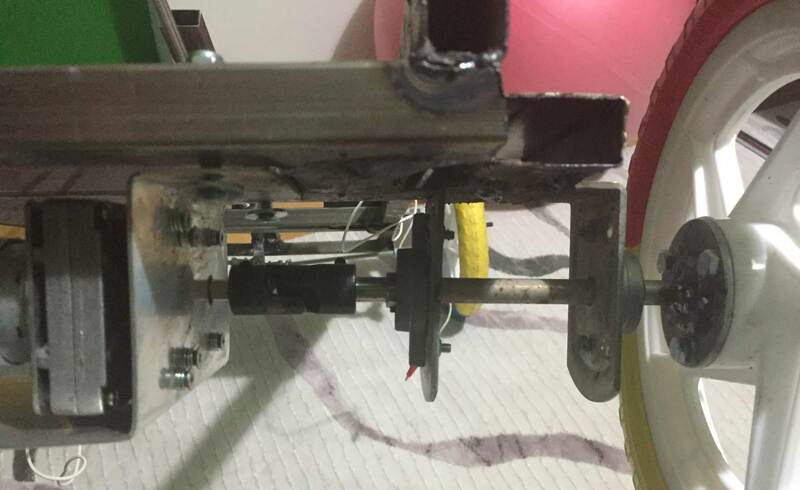 I thought that the steering was light and could break or crack in the overload of the material, so I completely filled the channels with hot silicone, completely dismantling the toy. I also filled the battery housing completely with hot silicone. 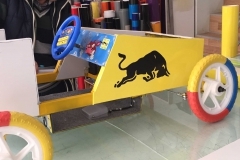 The steering is as shown in the pictures below. 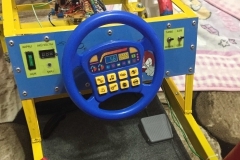 I changed my previous steering wheel to a smaller toy steering wheel because the diameter is 30cm. Now it’s 18 cm in diameter. 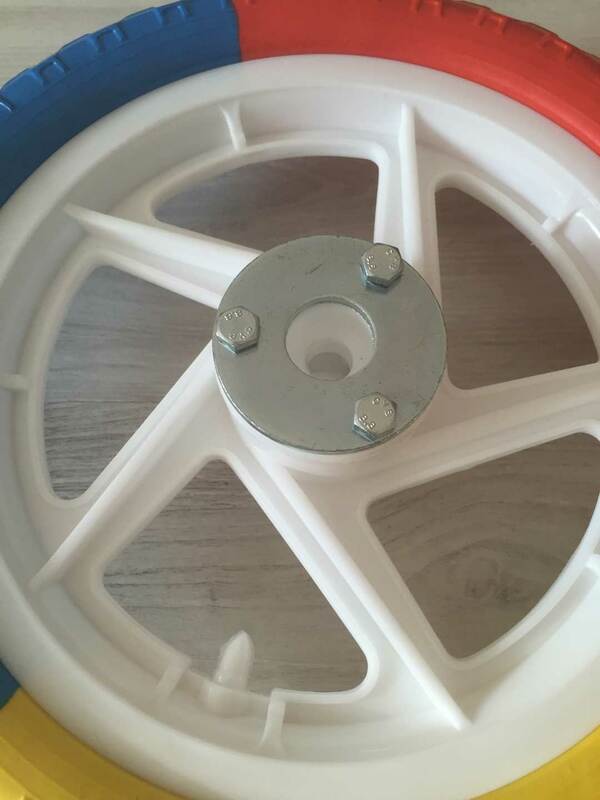 It is useful to talk about the wheels before going to the wheel and axle stage. 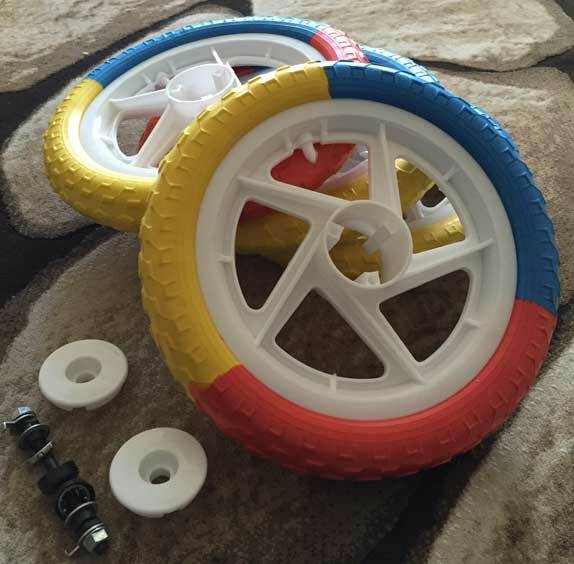 I chose the following 30 cm diameter wheels that I ordered from a bike online. 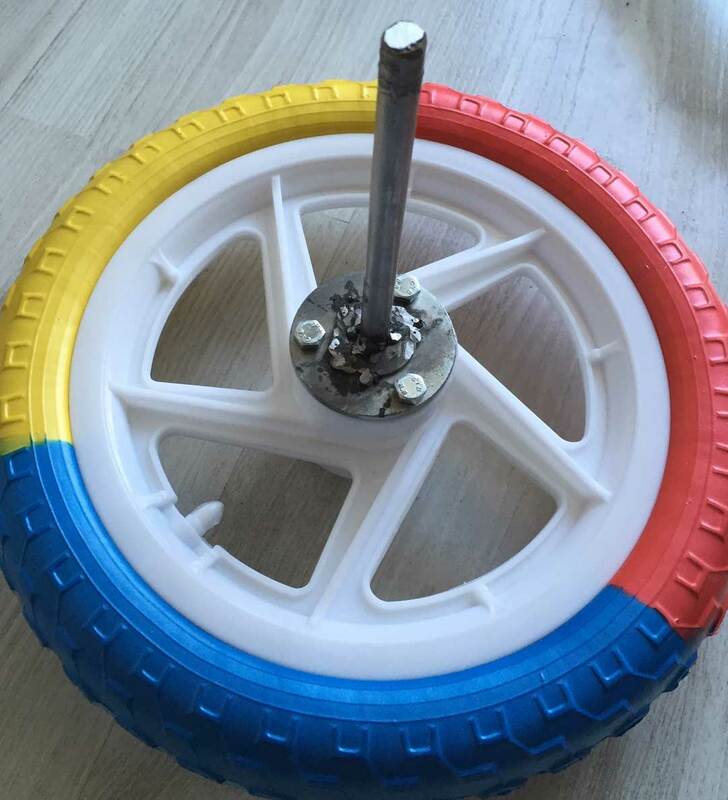 The biggest reason for choosing these wheels should be very light. 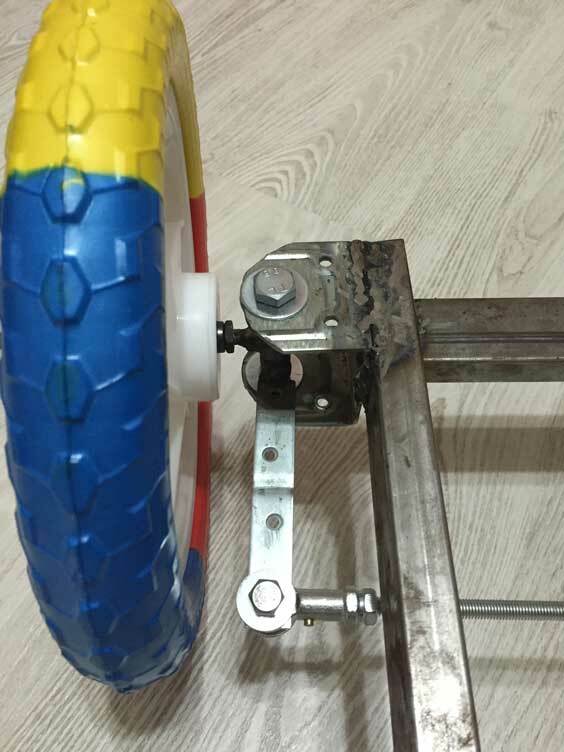 On the other hand, since it comes with bearing, the work for the front wheels is made especially easy. 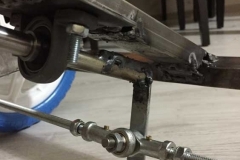 The part that provides the connection between the wheel, the axle and the chassis is as shown in the picture. 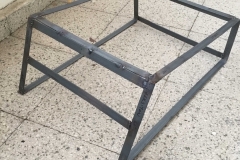 Until today, it was very difficult for me to bring these pieces together and weld them for a solder only. 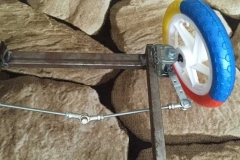 In my research, it was suggested that the angle between the wheel link and the axle link is 105 degrees, but I joined it in such a way that it could easily escape and be perpendicular to each other. 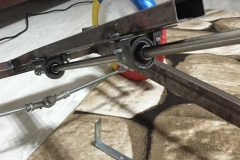 I made this with the help of 8mm diameter joints and 8mm diameter endless bolts to reflect the movement from the rod to the wheels and to enable right-left maneuverability. 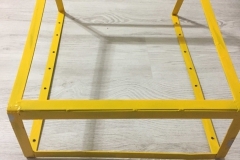 The four joints I used in this section were life-saving, because the system is made entirely of handcrafted material, so the deviations at joining points become so great and the joints can close the troubles here very smoothly. The parts used are collected under the heading Material List. 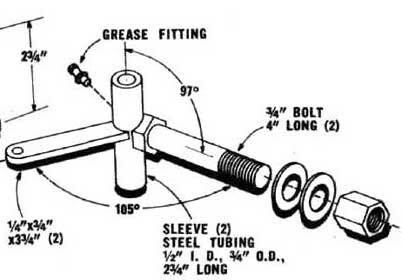 I used the bearings shown in the picture for the rod. 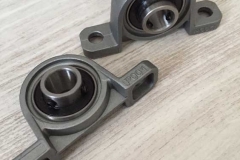 UP001 Roller bearing Inner diameter 12 mm. 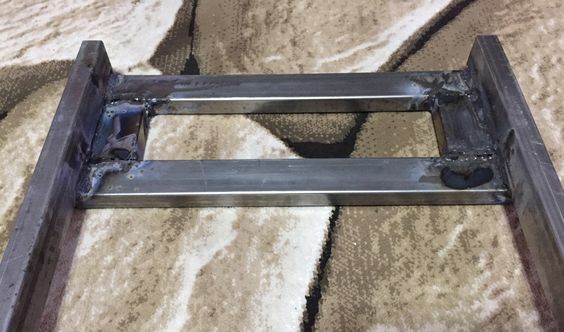 I used the 20x40mm box section, because of the thinness of the bearings, I prepared the bearings shown in the picture above from the sheet with a thickness of 2 mm. 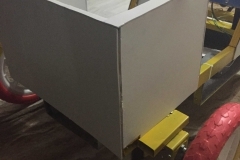 I made a box section from the midpoint of the box section on the front of the chassis to the point where the steering was located and cut it with a 37 degree angle on one side to give the required pitch. 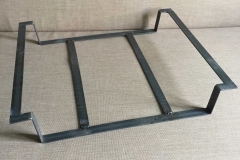 I have welded the beds so that they stay 10 cm from the ends. 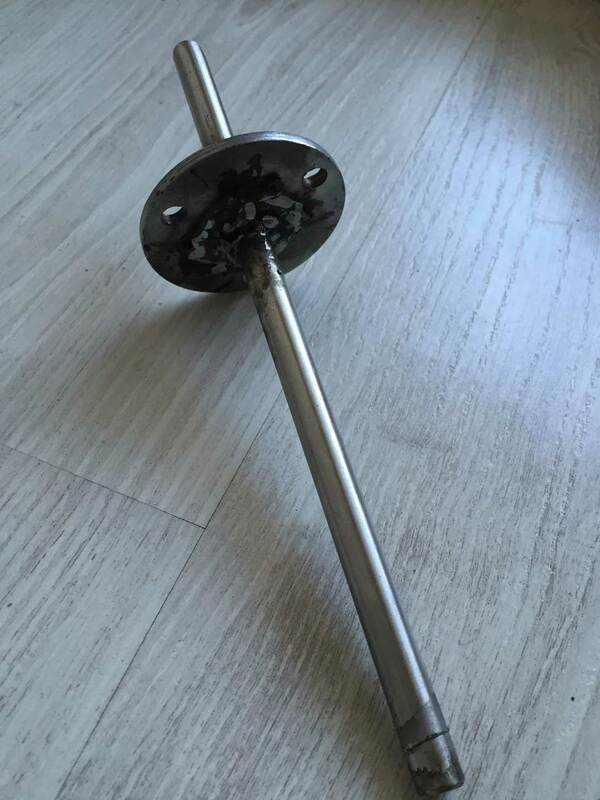 I used the steel shaft to test the condition and I used it for the bearings and rods. 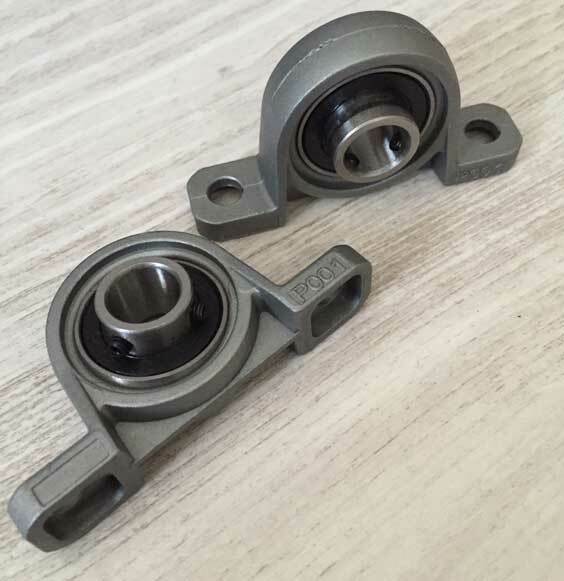 I removed the rod from the bearing and welded the L-shaped bended flat bar shown in the picture. 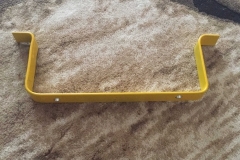 This part will provide the connection of the rod to the joints that are in the middle. You can see the stage after merging in the picture. 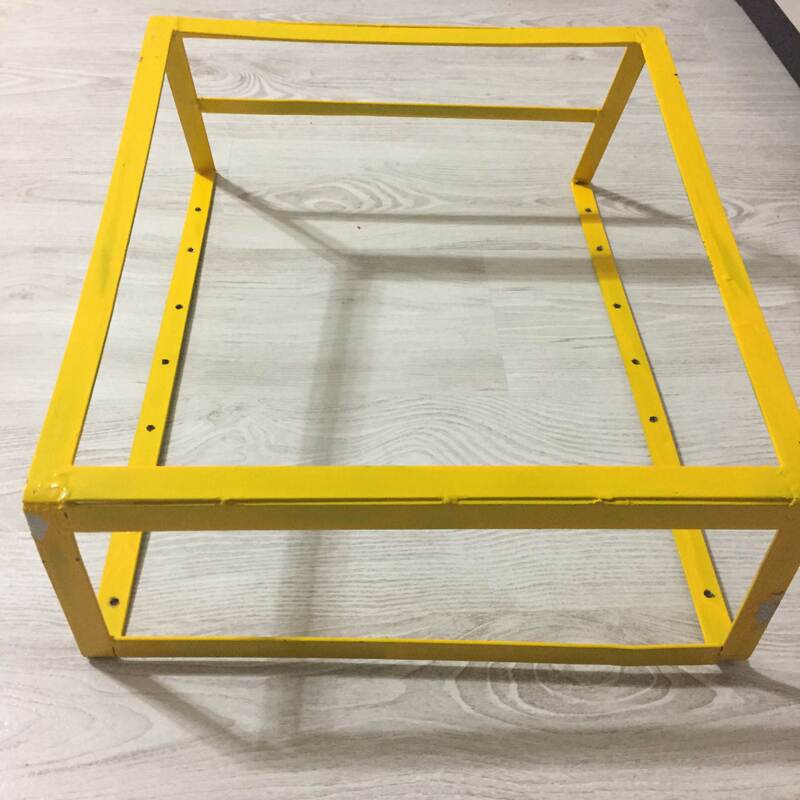 The long side of the lower part will be cut. The general pictures are also like the picture. Rot is 1 meter long. 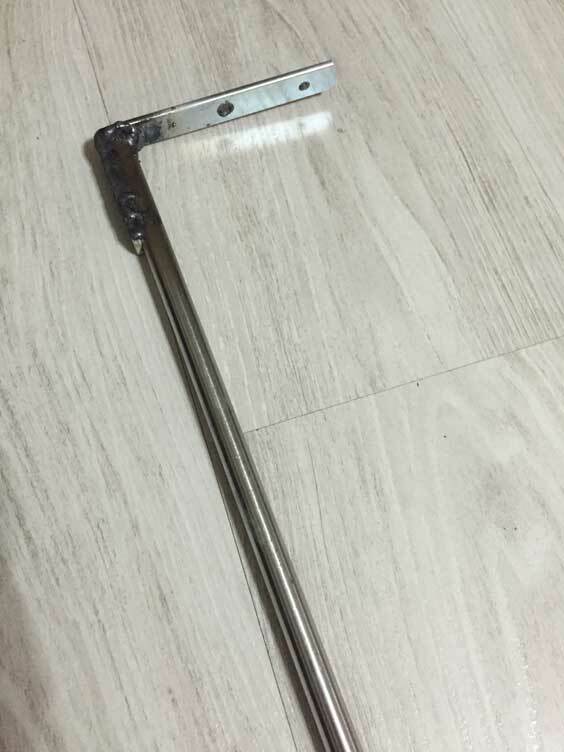 The length of the used profile is 50 cm; I will leave a gap of 10 cm and cut the rod. 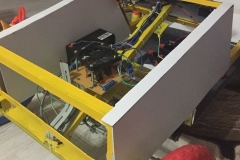 I tried to clarify the working mechanism with videos. There are color or shape differences in the same article as the edits and updates are done over time with the related topic. I am trying to update an existing article as the corrections take place. 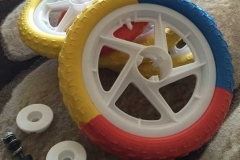 Unlike the front wheel, the rear wheel consists of fixed parts and should be considered as a separate project because it will move with the power it receives. 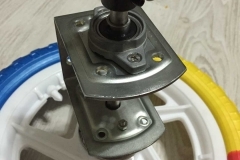 I used a 60×22 mm washer to fix the rear wheel shaft, mile; this washer matches both the inside of the wheel with the hub and is quite thick in terms of handling. 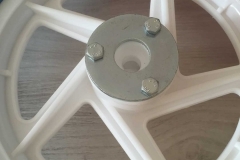 I made 3 new holes with 6 mm diameter on the washer by making use of 3 holes in the wheel center. 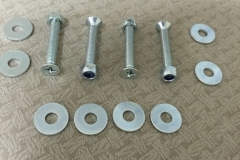 The used screws are 6×80 mm in size. 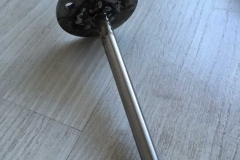 The steel shaft I used between the engine and the wheel is 10 mm in diameter. 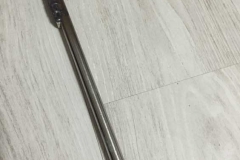 The shaft length shown is 22 cm. 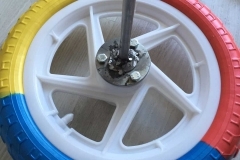 The distance between the motor and the wheel is 14 cm. 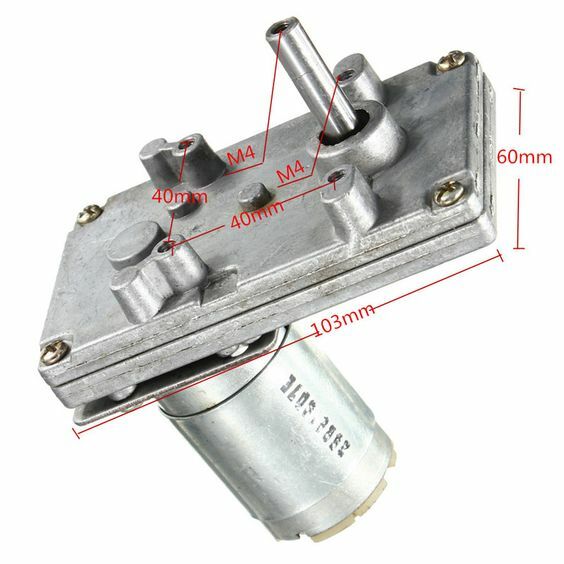 Because the shaft of the motor is 8 mm; I chose this 10 mm. 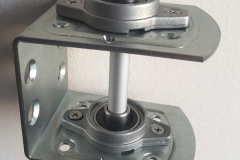 On this end, both end joints can be joined together. 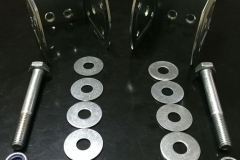 I want to use the washer an inner diameter of 22 mm as disk, I have welded two washers with a diameter of 24×10.5 mm to provide connection with the shaft. 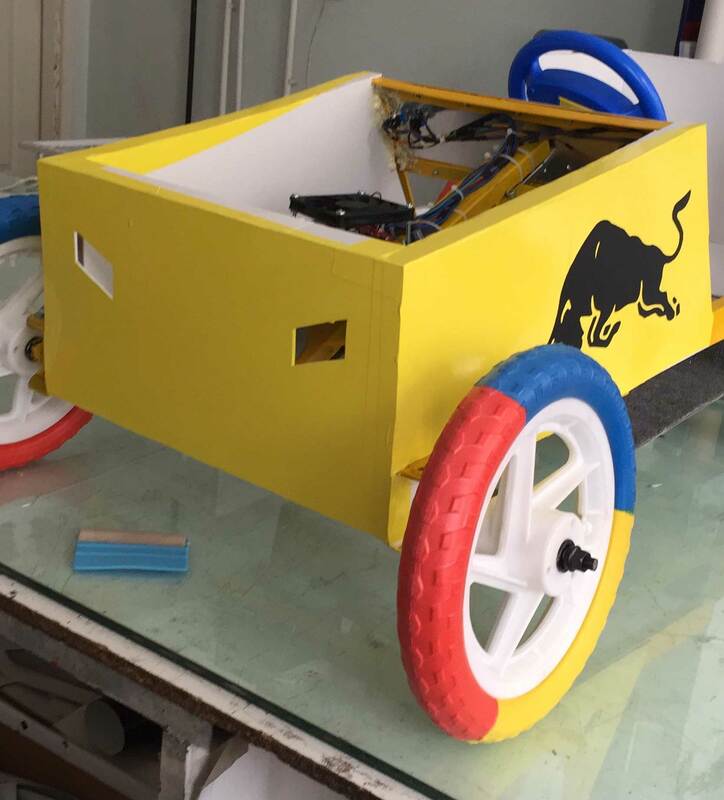 After reaching the final form shown in the picture, I assembled the moving parts which will provide connection with chassis and motor. 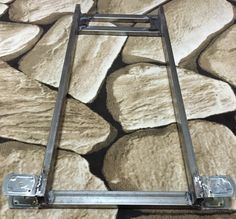 I used the wall mount shown in the picture to connect with the chassis. 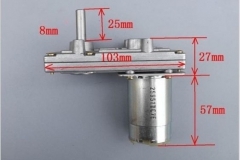 The part is easily found in the hardware market. The advantage is that it comes with holes in various sizes on it. Though I had to drill again from the places I needed, but the important thing was the hole in the center. 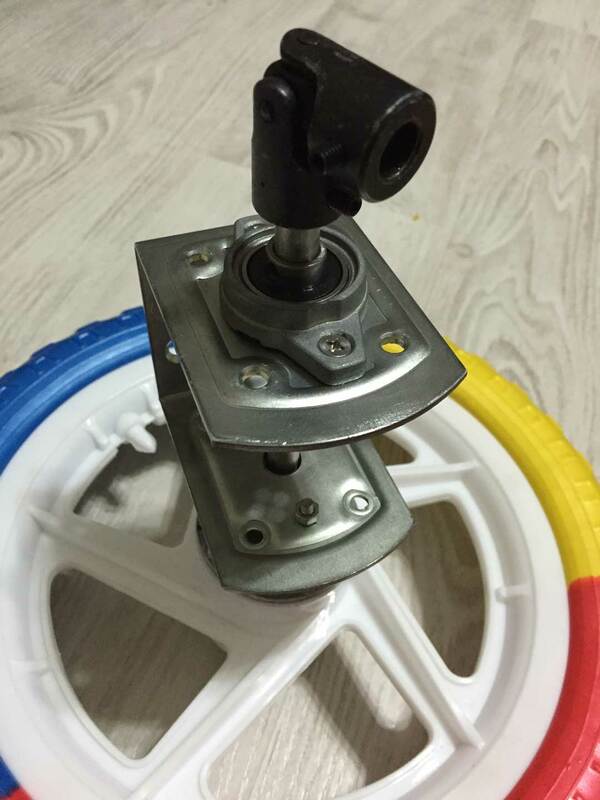 I used UFL000 bearings with an inner diameter of 10 mm in the picture to provide frictionless and comfortable movement. 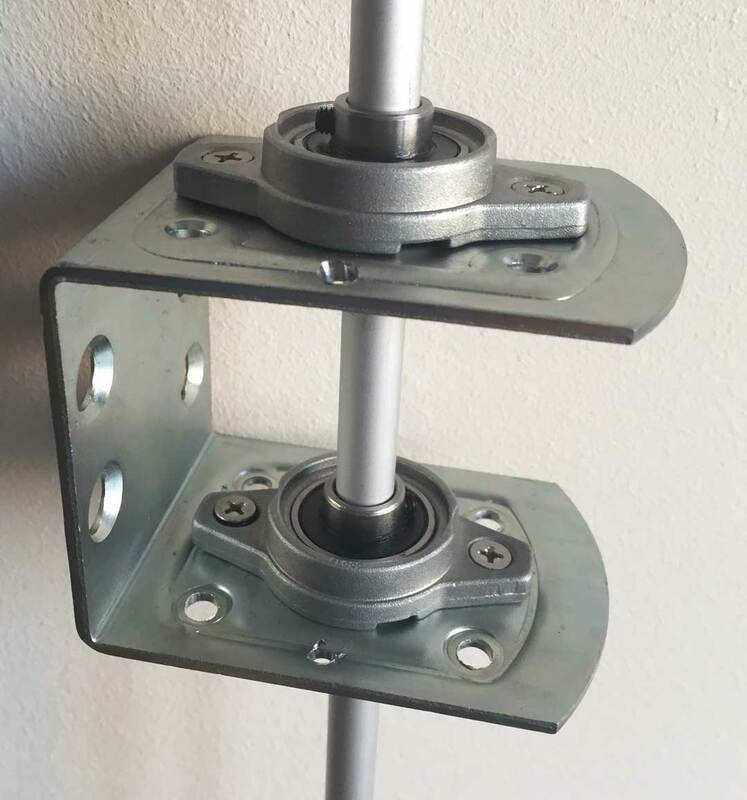 I had to open new holes on the holder for these bearings. 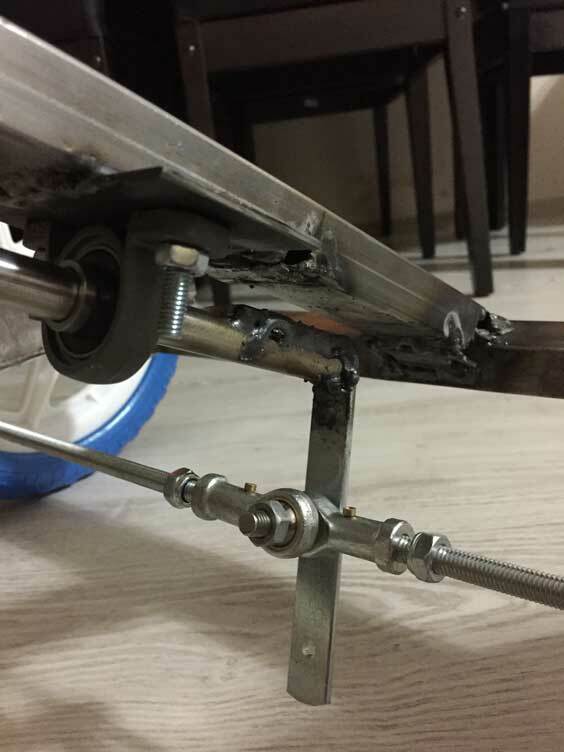 I fixed the bearings with the help of M6 screws and nuts. 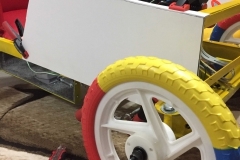 The final process for the wheel system was to provide the connection with the motor. 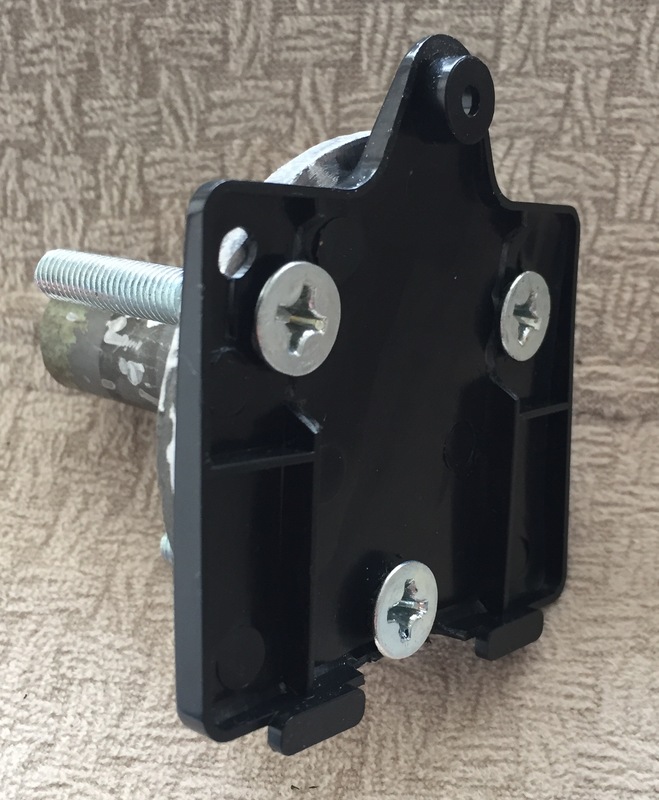 This is very handy for it, but I also use a steering universal joint, a mechanism that will reduce errors and deviations caused by handmade to a minimum. 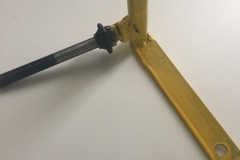 The diameter of each end of this joint is 10 mm. 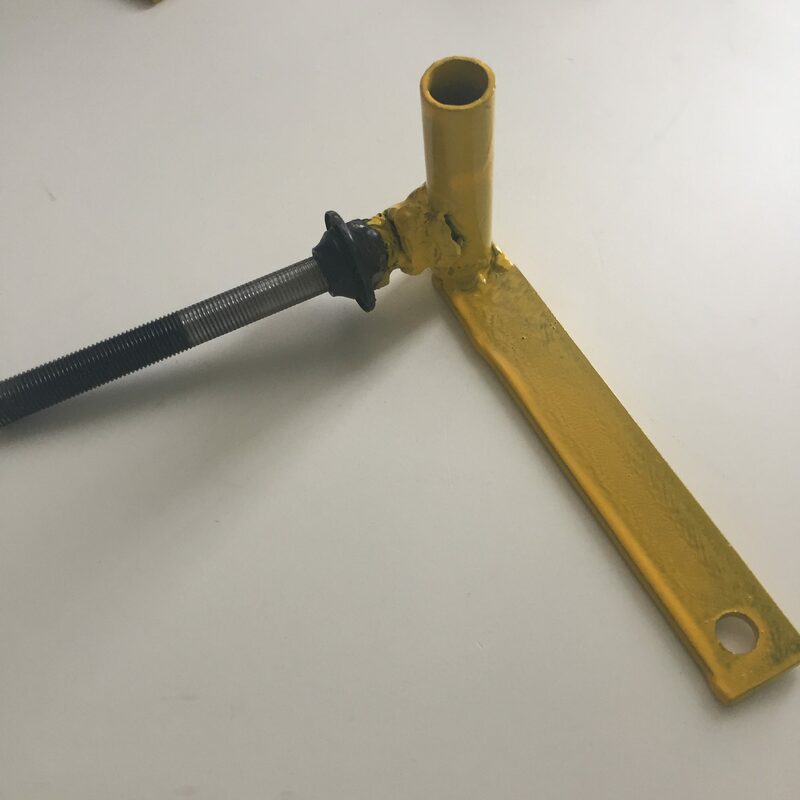 The biggest problem of this simple piece is hard to find in hardware. So I have to order over aliexpress so fortunately I reached the elite in a period like 15 days. 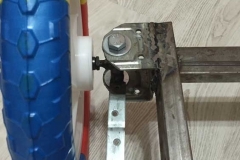 As I mentioned above, since the motor shaft is 8 mm long, it is 2 cm long to join this joint to the motor; I used an aluminum pipe with an inner diameter of 8 mm and an outer diameter of 10 mm. 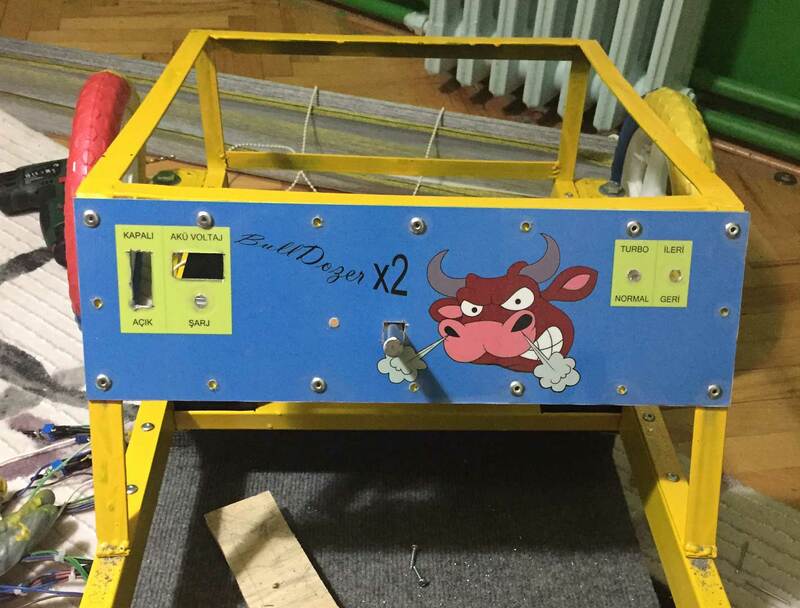 It is easily located in the hardware markets and the price is also quite reasonable. 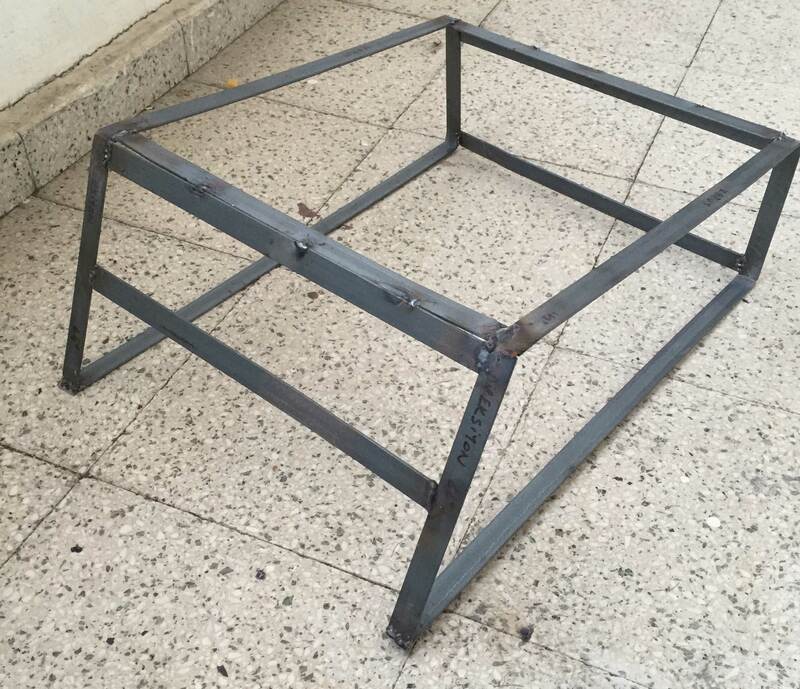 The only problem was I had to get 1 meter for the piece, which I’ll use a total of 4 cm. 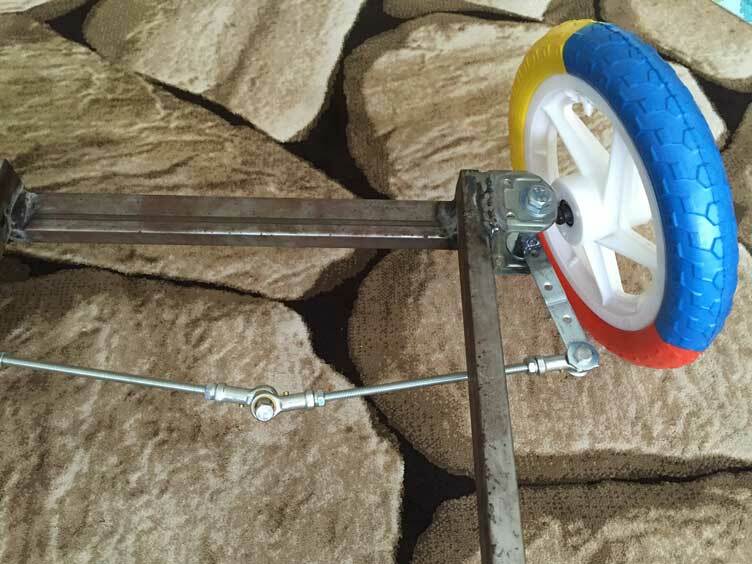 The link between the chassis motor and the wheel is, as a result, as shown in the picture. 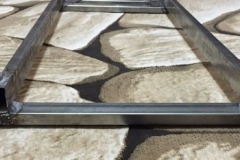 The final test work, which is done manually by fixing the ground before welding, is like the video. 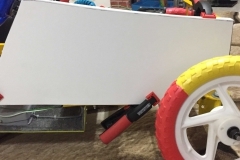 The video also clearly shows the benefit of the steering joint. 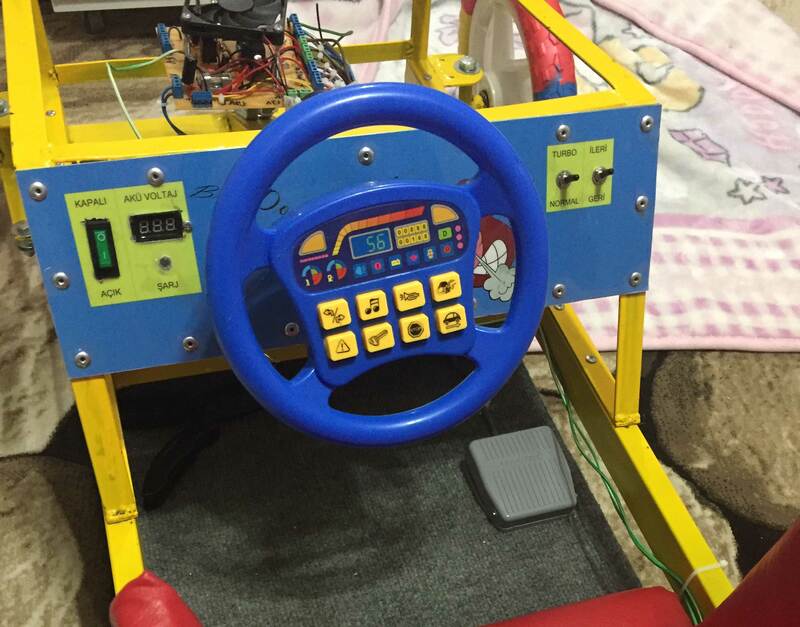 The wheel keeps spinning when I can not fix the wheel system very smoothly. 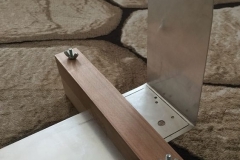 The test after assembly is like the following video. 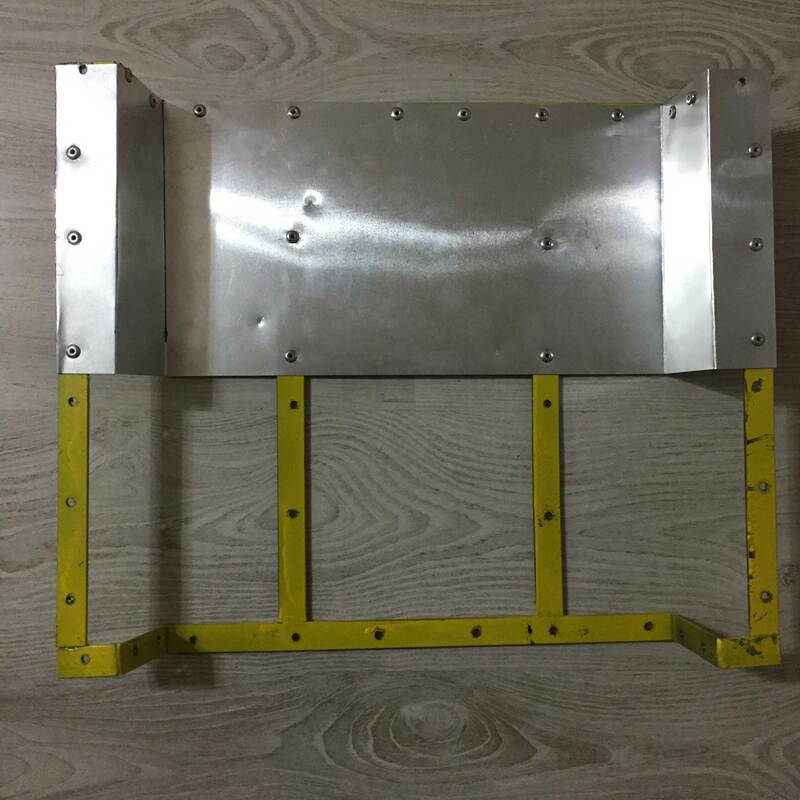 Previously I used 120×1000 mm to make the motor mount and 0.80mm in the thickness and 120×400 mm in the remaining part. 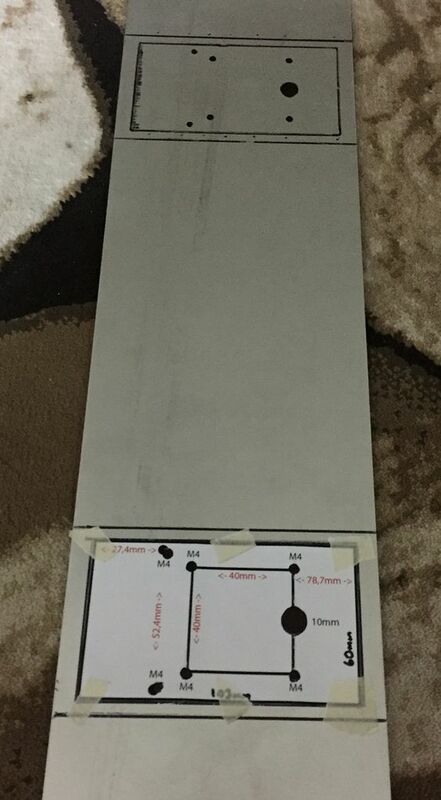 After cutting, an empty post package cuts a suitable edge according to these measurements; switch, battery voltage indicator, position for rotation and direction switches on this template.. I made the design shown below in Photoshop using the measurements I set on the template. 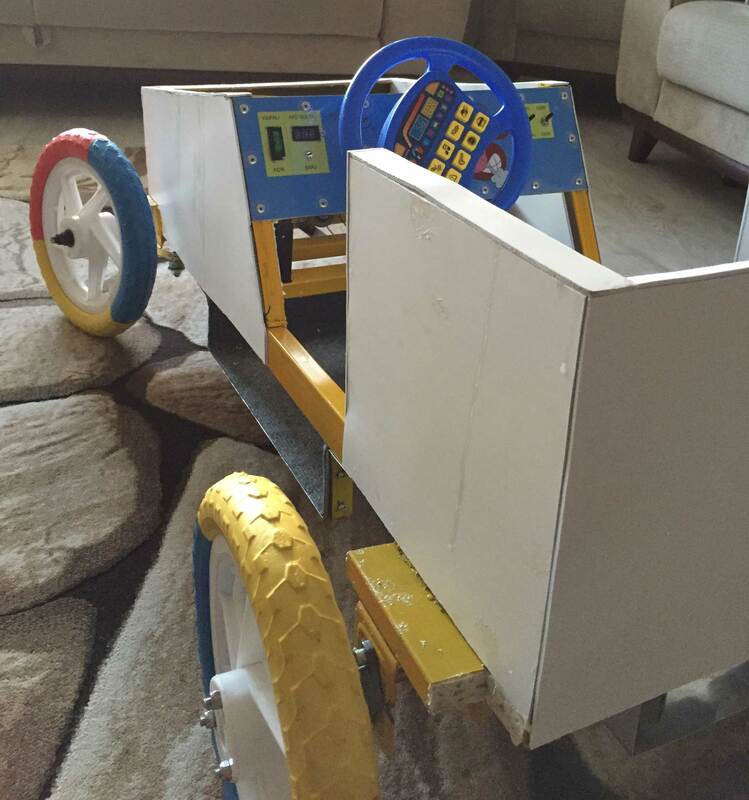 Because I made the car for my daughter, I tried to make a very colorful design. I bought the print on the self-adhesive A3 paper and laminated it so that the color and the color did not deteriorate with time. I put this print on the sheet metal on my hand. Since all areas on the print were already specified, I made the drilling and cutting process after printing. 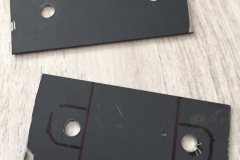 I cut paper tape on the edges of the cutting areas so that the film was not damaged due to overheating during cutting. 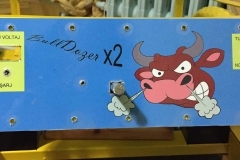 Because of the tests and the materials I use, I think the vehicle is very powerful if I do not have a setback, and I decided to make the name of the vehicle Bulldozer. 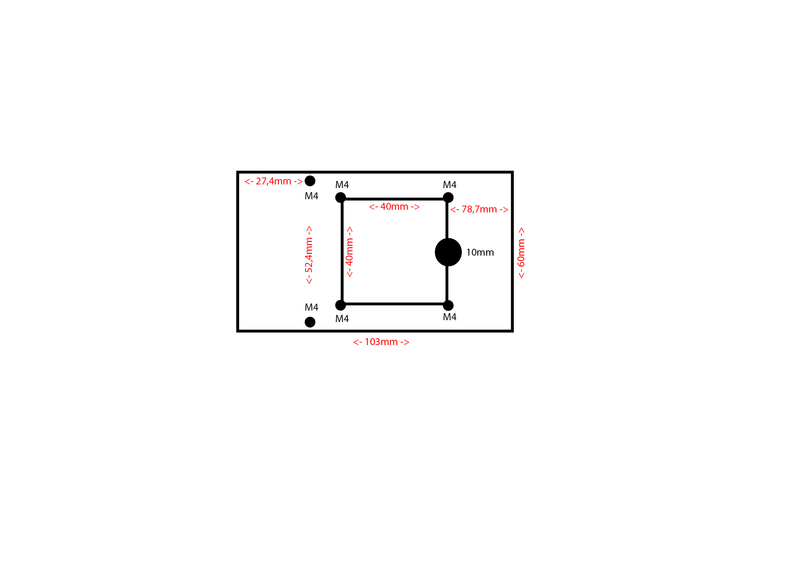 In Photoshop, with the help of guides I set the locations and measures of the areas to be pierced and cut in millimeters. 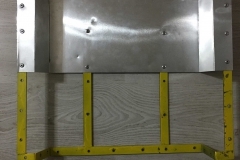 Since the width of the wedge iron in the area to be fixed is 20mm, I have determined the mounting holes accordingly. I planned the location of the other equipment to be far from this edge. 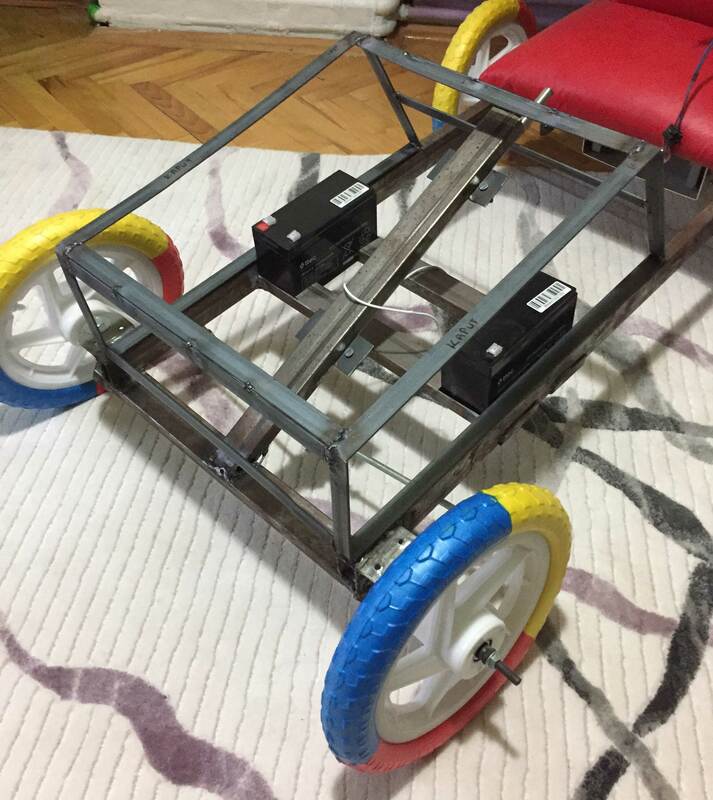 At the same time I tried to keep the equipments on the edge because there was a steering about 30 cm in the middle point. I made the assembly with A5 8mm rivets. 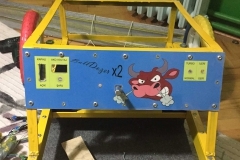 I will try to explain the equipment on the electrical heading. 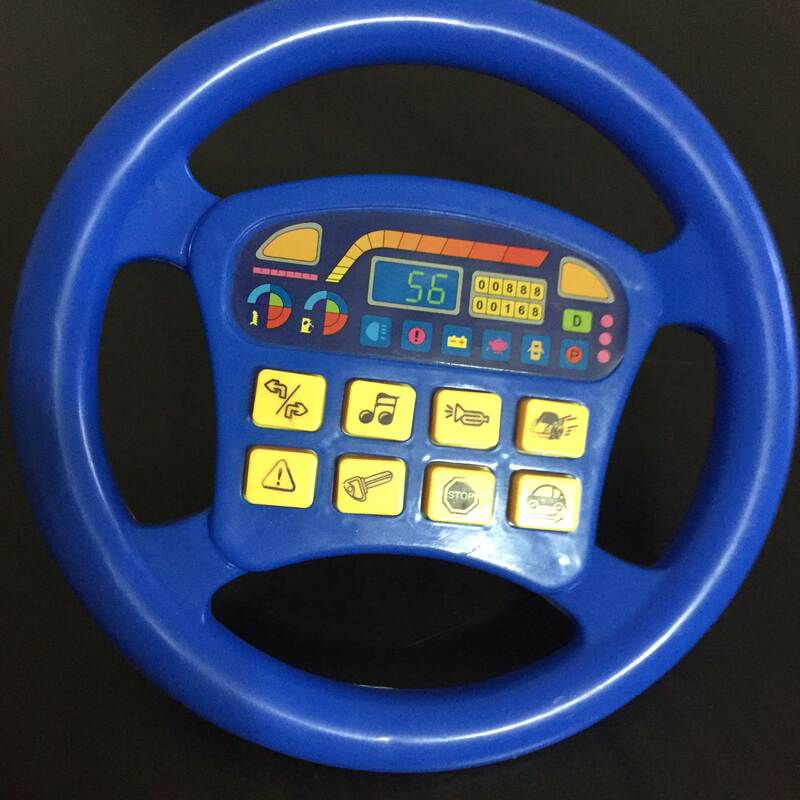 I was actually looking for a suitable toy car seat for the seat. But when I could not find my seat, I decided to use the massive trees in the interior. 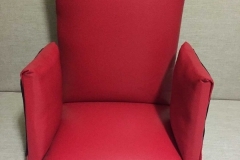 I had to buy staples to install the upholstery, but fortunately the price of a staple at the entrance level was not very high. 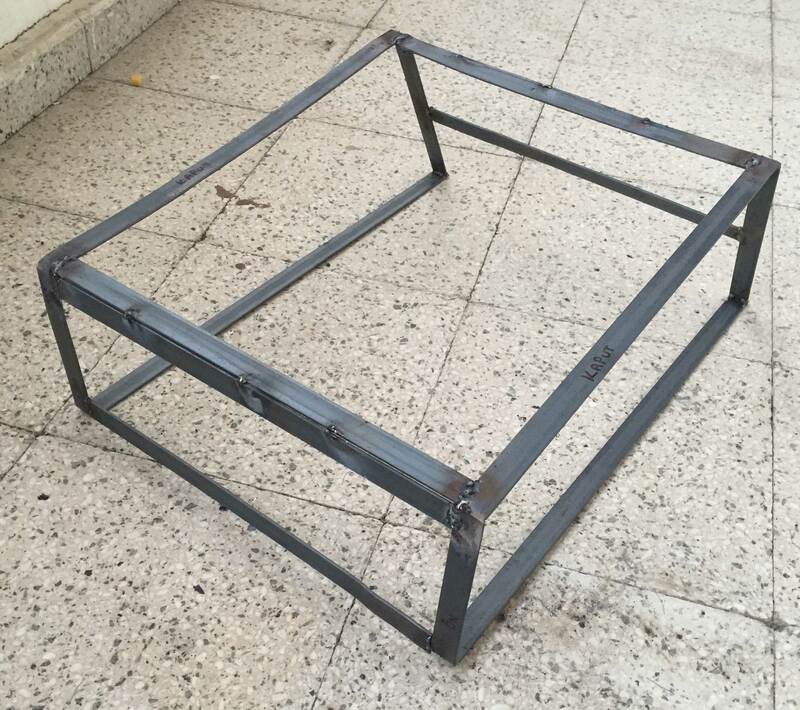 Cut two pieces with a 30×30 cm seat and 30×40 cm back. 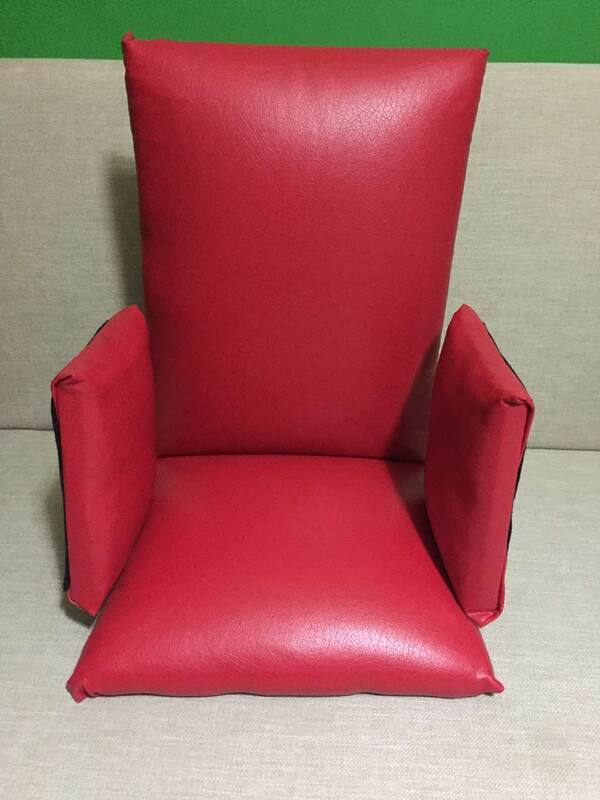 I decided to have the seat color red and ordered 2 meters of leather upholstery. Actually, 2 meters is pretty much., but I did not want to have problems because I was a beginner. 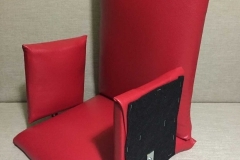 I cut the leather according to the measurements on my hand, first I stapled it from one side and I put the sponge between the wood and the leather, stretched the leather and stapled it again from the opposite side. 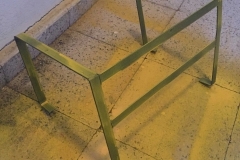 Unfortunately, my workmanship in this area gave ugly results at the corners, but when I looked at the whole, the result made me happy because I took what I wanted. 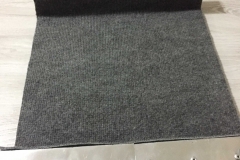 A black lining I found at home to hide the ugly staple image on the back; I put it on the back and bottom. I screwed the base and back to the rear and side walls. 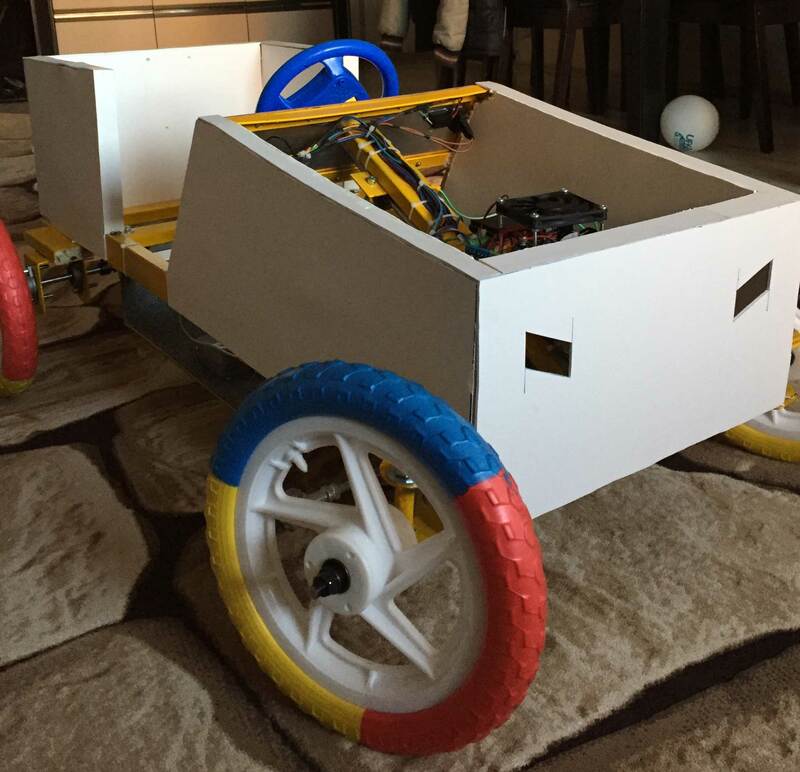 I thought that the back part was particularly long, thinking that it would be backfires when the car first started. 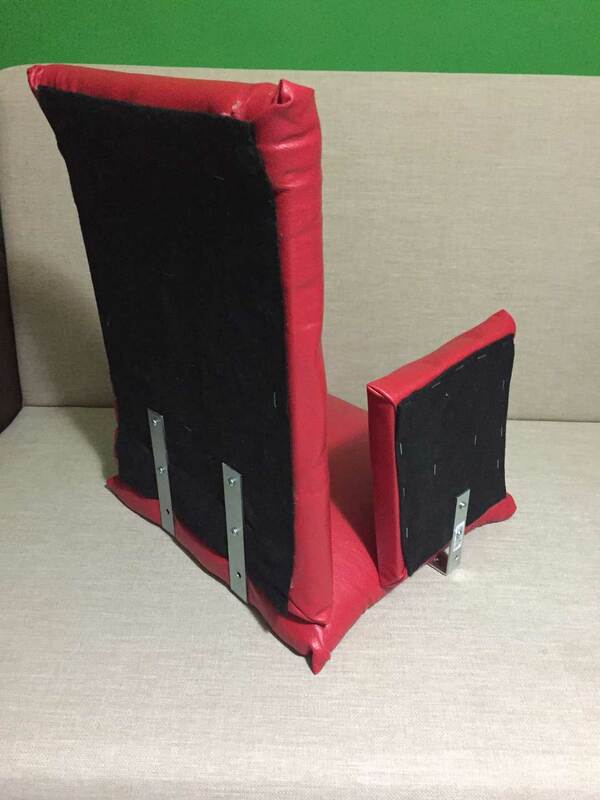 I also thought that the side parts were insecure after placing the seat and I used the same method to install the armpits shown in the picture with the last sponge and wooden pieces that were removed. 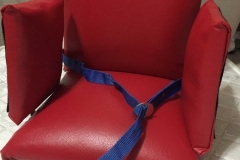 I pulled the safety belt from an old toy and screwed it and stapled it both ways so that it would not be obvious where the child would stumble or move in the car. 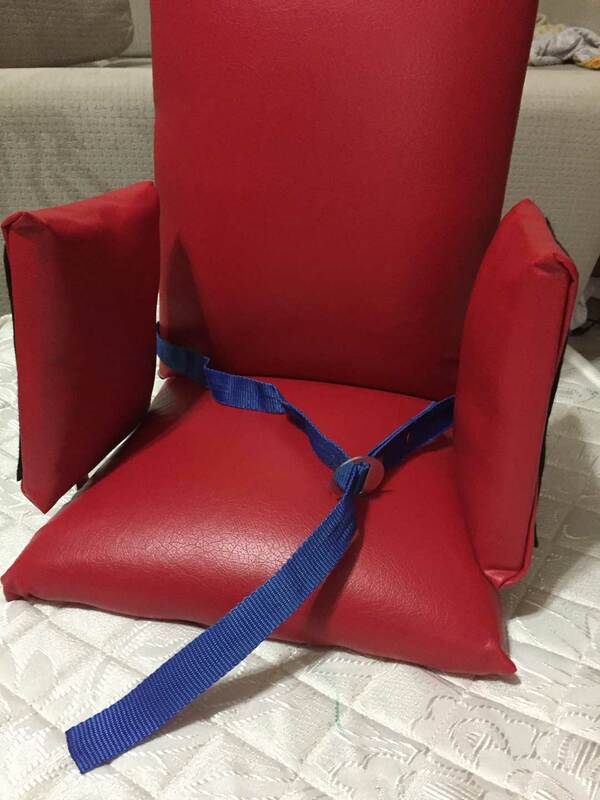 The seat is like the one pictured in the vehicle. This issue is the most I think about my head the most; until the end it was the only one that had no idea. I decided to build and install the skeletons that I tried to describe at the beginning of the previous topic, first of all, then how to do it. After these settlements, the figure part was already settled by itself. 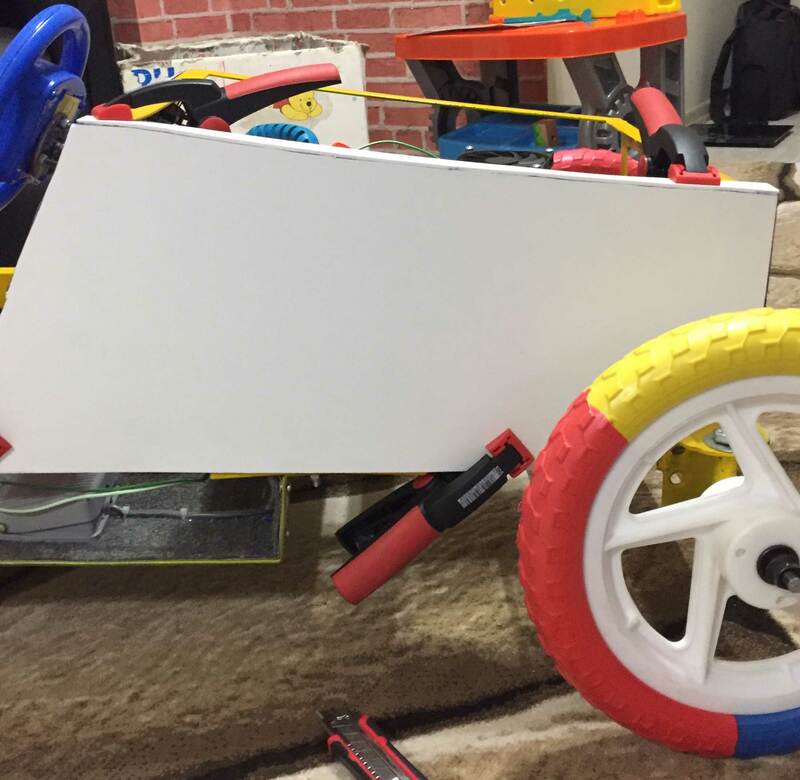 I was thinking of using 0.3 mm sheet metal until the last moment when I was thinking about how the coating should be, but after a brainstorm I decided to use PVC foam sheet. I also noticed that I made a very correct decision when going through the coating phase. Because the double-sided bant, the advanced adhesive, and the make-up knife had almost done all the work. I will apply drawing and cutting as clear lines as the area. 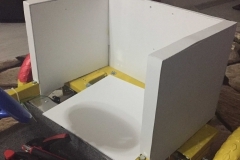 I glued transparent double-sided bant on the box section and wedge iron and directly bonded the PVC foam sheet. 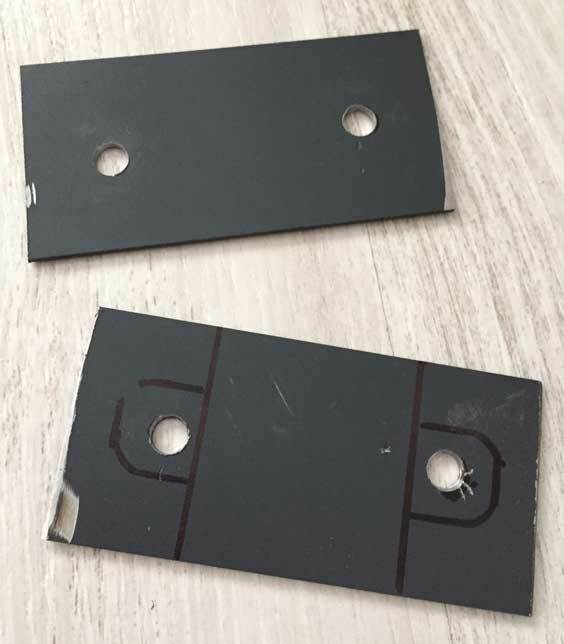 I also cut thin PVCs to the edges and glued them with double-sided bant again and glued them together with the main PVC and the edge of the advanced adhesive. 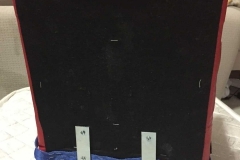 The thickness of the PVC I used was 3 mm. 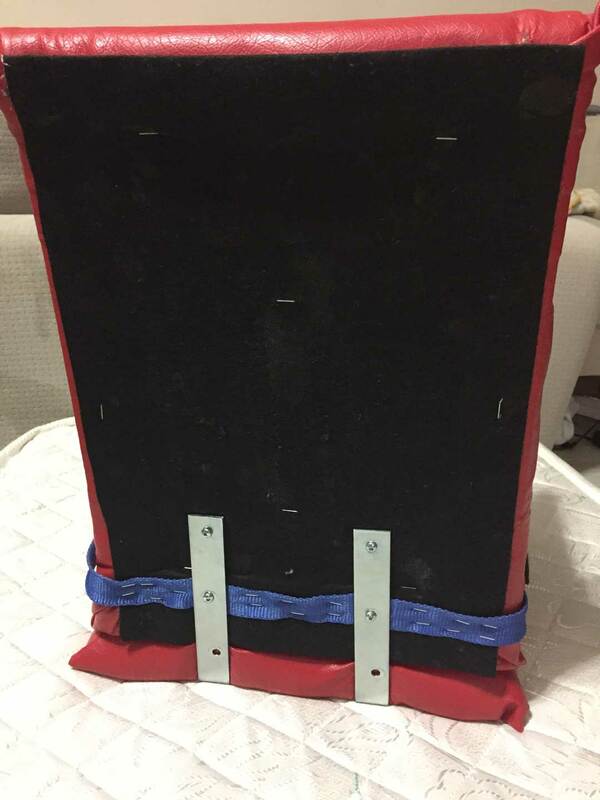 I covered the edges of the hood underneath the hood to get my work done with PVC, and I poured into the gap between the two PVCs and used pu foam. 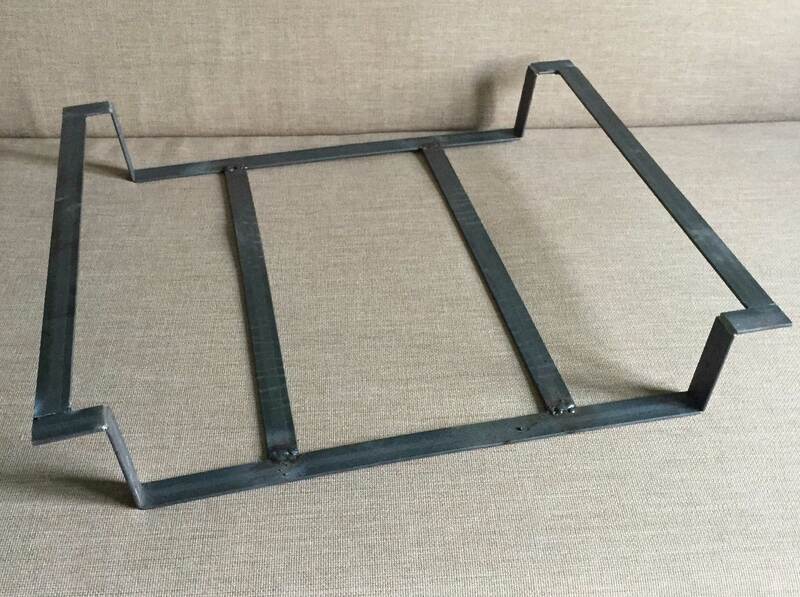 As I mentioned at the beginning, I actually wanted to use sheet metal, but I also had reservations in this regard. 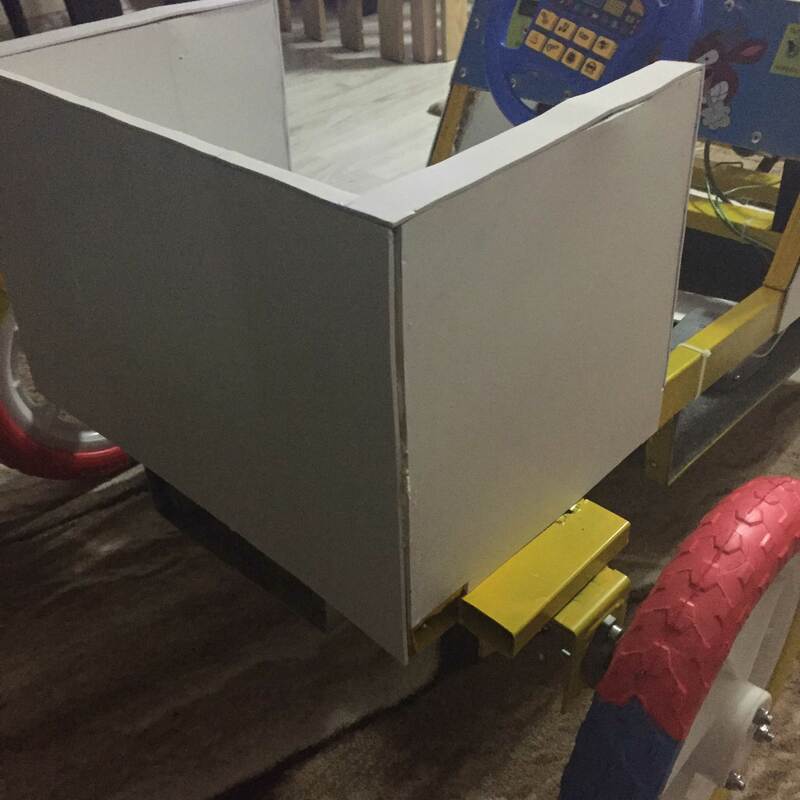 For example, the edges are very sharp and cause harm to the child. At the same time there was a loss from the child; like sitting on your car. In this case, this alternative is overworked because permanent deformations will occur in the body. 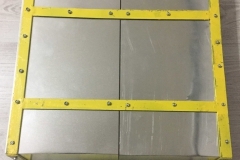 Even if you see the damage, only that part can be cleaned with a knife and can be easily attached with a small piece of advanced adhesive. 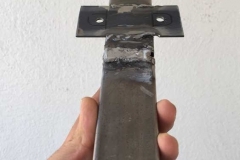 One of the greatest advantages is the easy elimination of mutual incompatibilities that arise from iron bending, cutting and welding faults. 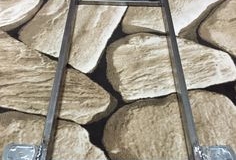 You can see the coating process in the following gallery. 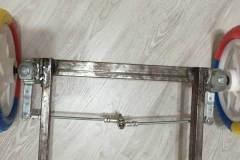 I was thinking of strengthening the hood with an iron frame and sticking PVC on it, but the PVC with 10 mm thickness came up and the hood cover was also loosened with a suitable cut. 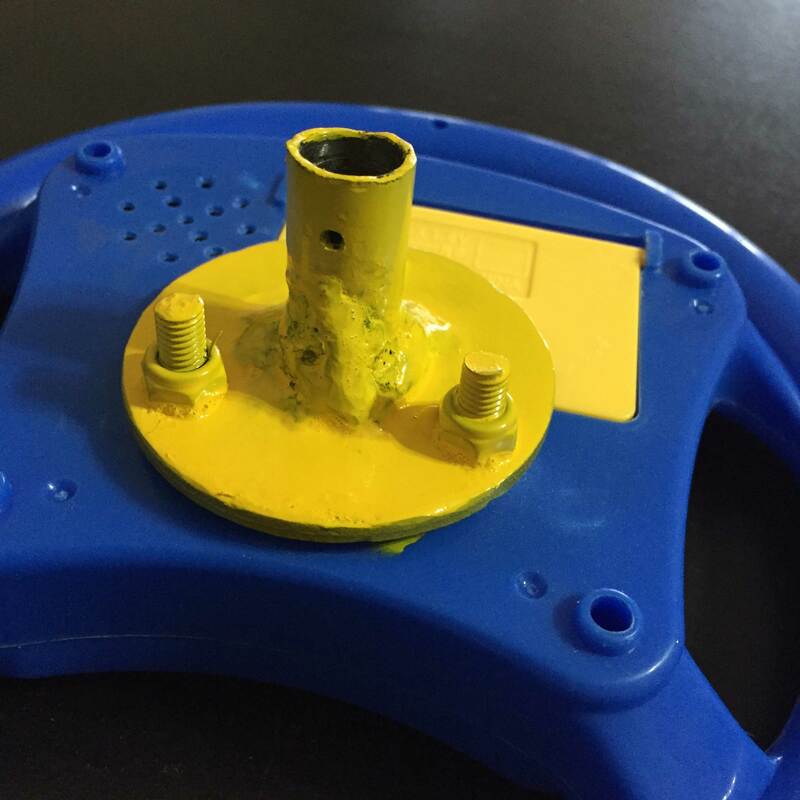 At the end of the process, I tried to prevent the corrosion of the exposed sections by filling them with pu foam. You can see in the last picture. I have not thought about painting since the painting process is always the most challenging part of me. Along with the PVC used for the hood, the most sensible and fogging material was foil. 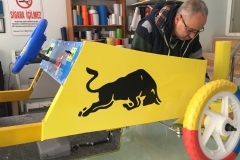 Since the color in my head is yellow from the beginning, we chose yellow on the foil, and all of the car’s covered with PVC was covered with this foil. 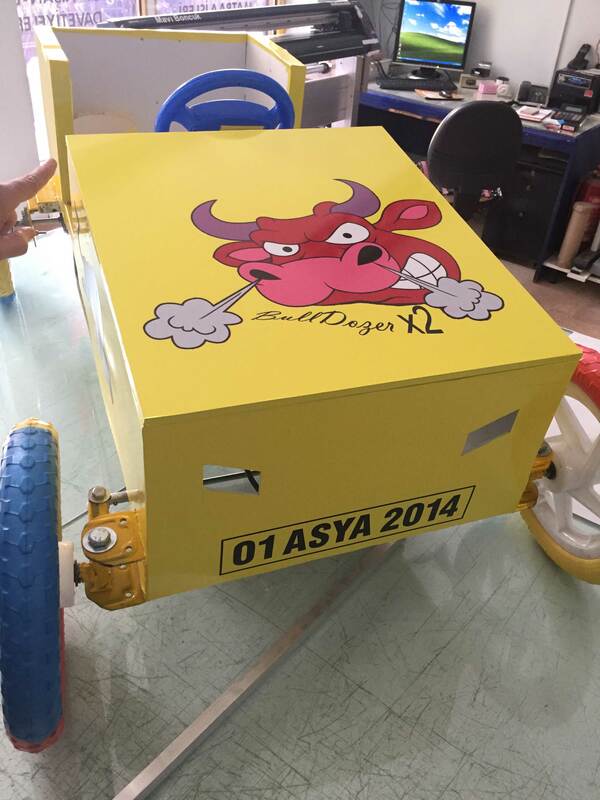 It was then adorned with a bull figure running along the front right and left sides. 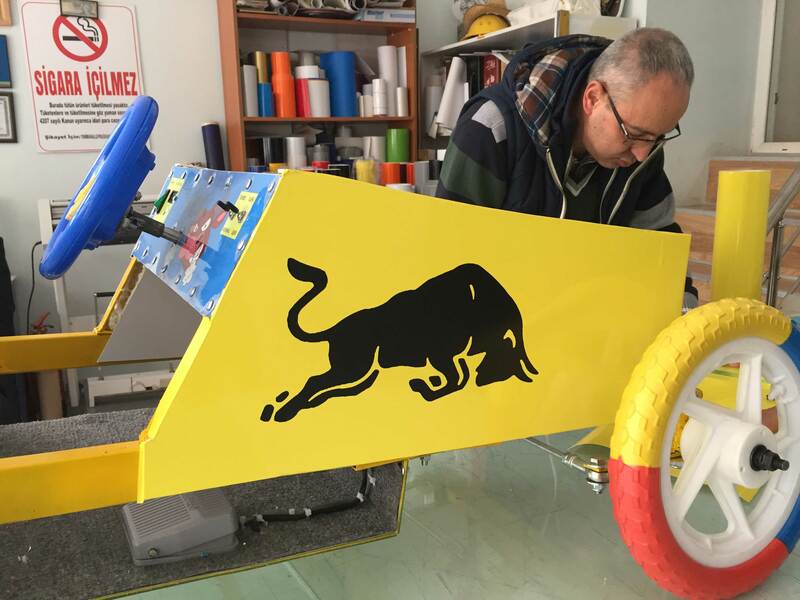 Since I think of the Bull image on the steering hatch from the top of the hood, we only had to take digital prints for this part. 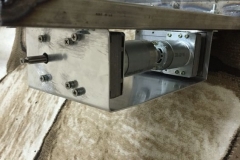 In the simplest case, the installation of the running system is as follows. It may not be necessary to use a transistor for its operation, but I prefer to use it for a more regular system. 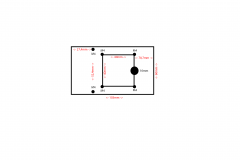 When we talk about the general characteristics of the circuit; Two 12 Volt 7 Amp batteries are used in series, which gives me 24 Volt 7 Ampere power. 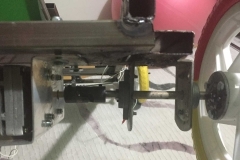 I tried to connect it in parallel with the acuity in order to provide a longer charging time, but the information that the motors can work with 12 Volt was a serious performance drop. 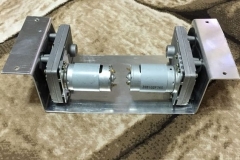 The motors are connected parallel to each other. 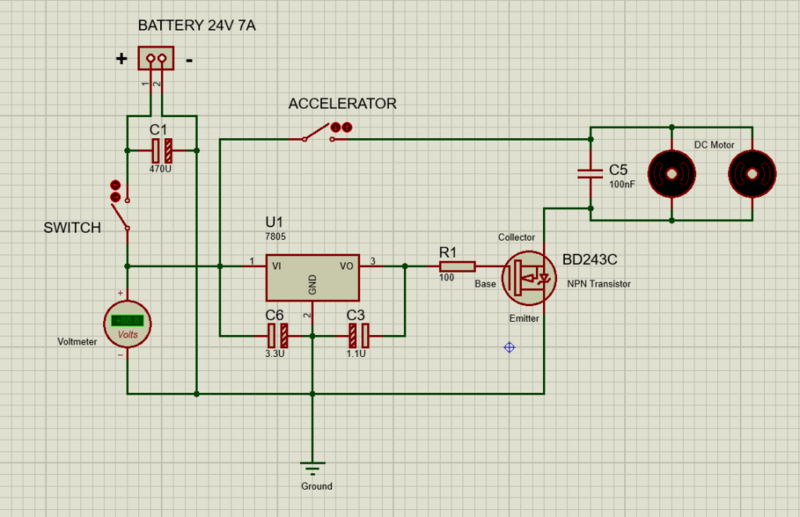 The 7805 regulator circuit here is only to provide a current of 5 Volt 1 Ampere to the base of the transistor. 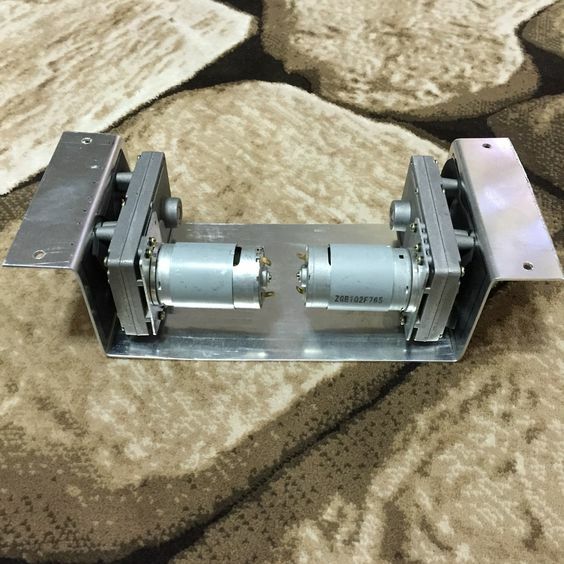 The capacitors are used to minimize the fluctuations on the circuit. 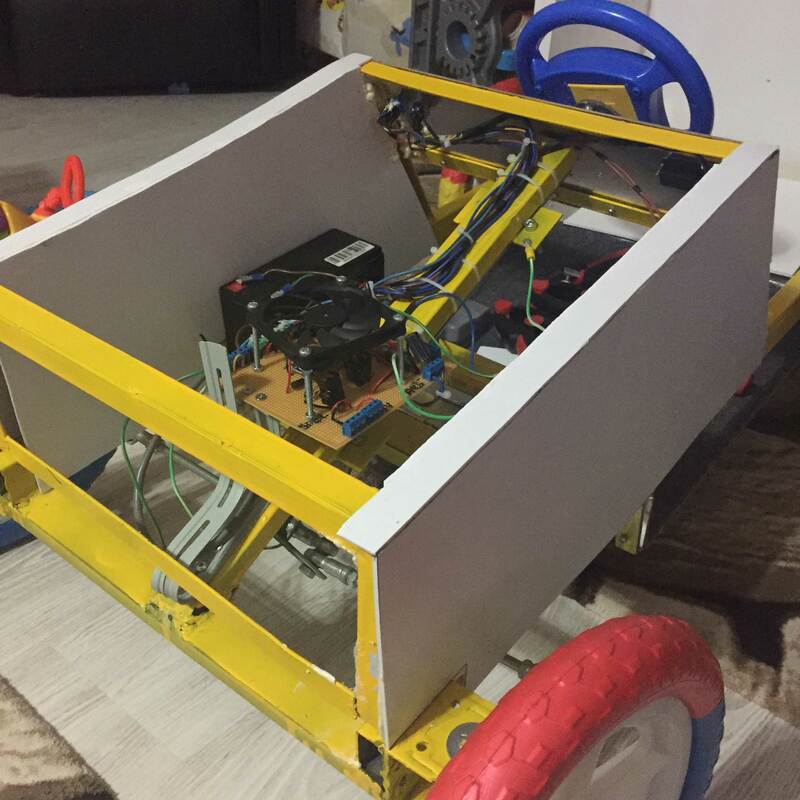 I’ve been working on the opportunity to make the car a little more featured with Arduino. But at the end of the work I do not know if I can explain the change here. It will be a fairly crowded text, both in terms of code and circuit diagram. But what I want to do is the following. Avoid possible collisions using a total of 6 distance sensors on both the front and rear sides (In the following video you can see how much trouble we have 🙂 ). When the car stops, the headlights go into flash mode. 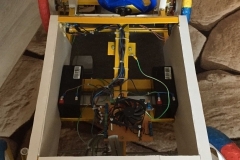 Moving forward and backward with wireless connection and controlling it from the driver. 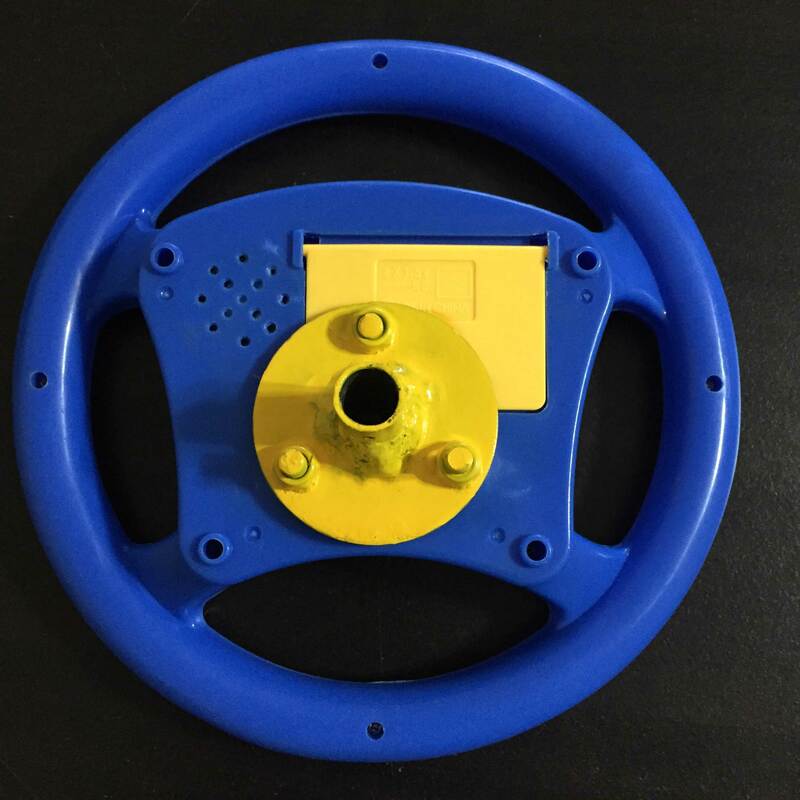 I do not have a project at this stage to turn left and right because I have to make changes to my mechanical parts so it does not work. Speed indicator and total distance taken record. 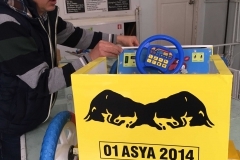 The use of current information with voltage value. 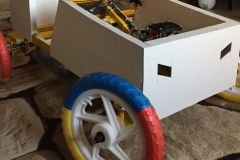 For a small presentation of the steps and the first test drive, you can access the following video (Turkish). 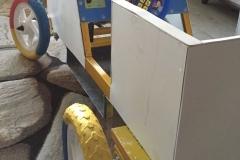 Battery Powered, Battery Powered Ride On Car, Build Your Own Car, Car, Double Motor Ride On Car, Homemade Ride On Car, Rear Wheel, Steering Wheel Panel. Bookmark.